Everyone needs a recipe that turns out perfectly EVERY TIME. 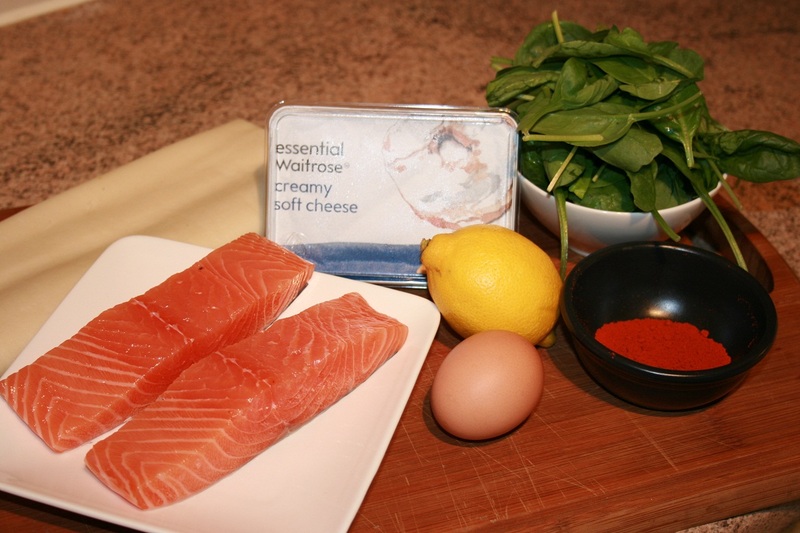 A recipe that you can trust to take care of itself. 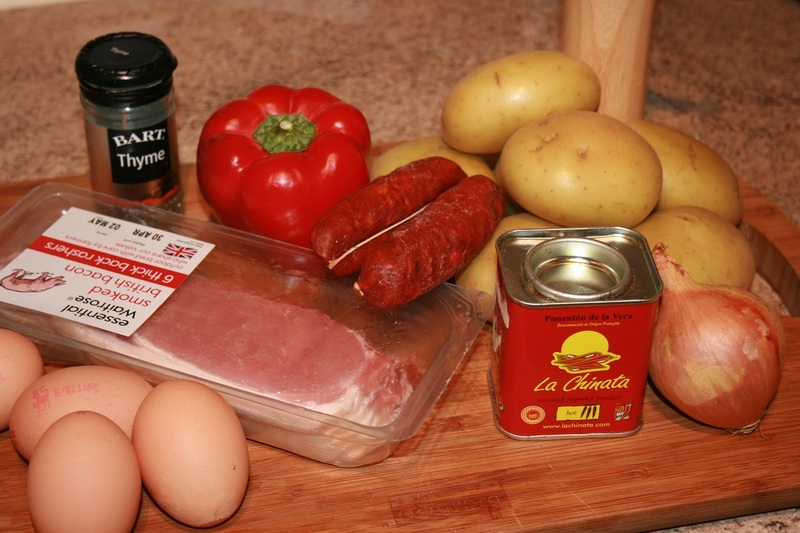 A recipe that you can prepare in advance and then pretty much ignore until it’s time to serve it. 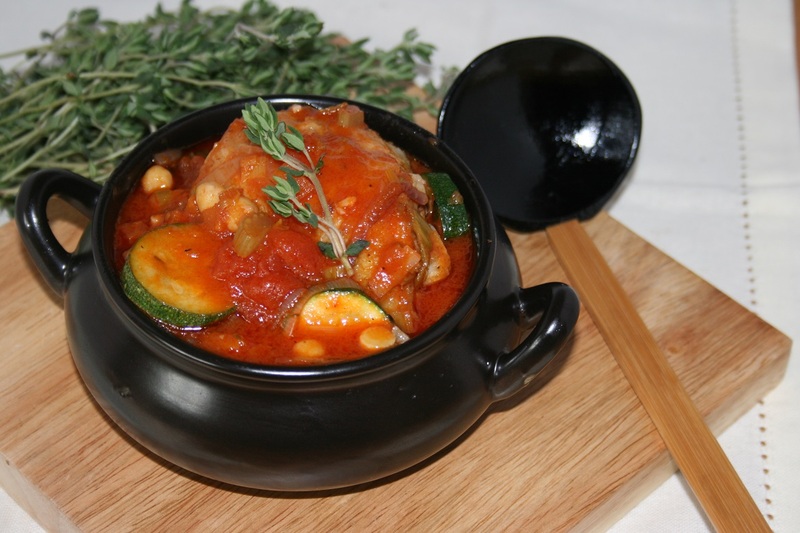 This is the recipe I serve when family are coming over and I’d rather spend time with them than time in the kitchen. The truly great thing about slow roasting the chicken this way is that the wine and stock keep it beautifully moist while the butter crisps the skin up to an amazing golden brown. It does take time though. Two and a half hours in the oven, but it honestly only takes about ten minutes actual work. Preheat the oven to 160°C. 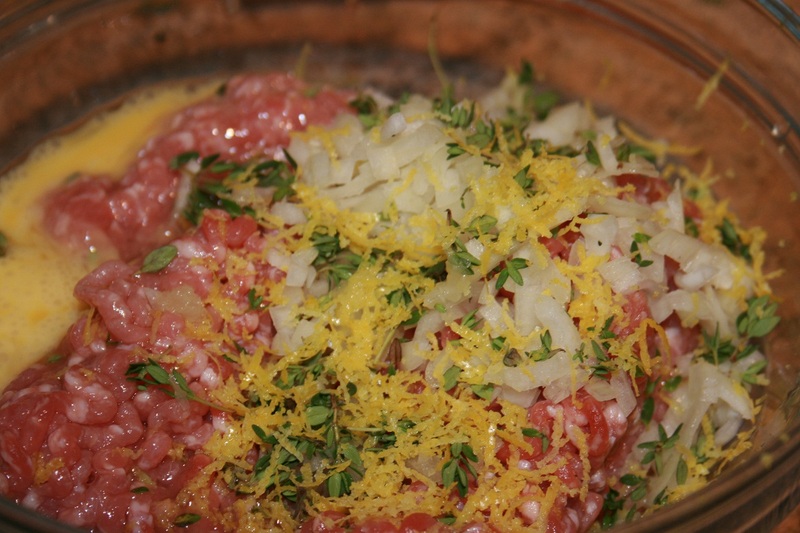 To make the stuffing, add the mince, thyme, lemon zest, onion and egg to a bowl and season with salt and pepper to taste. 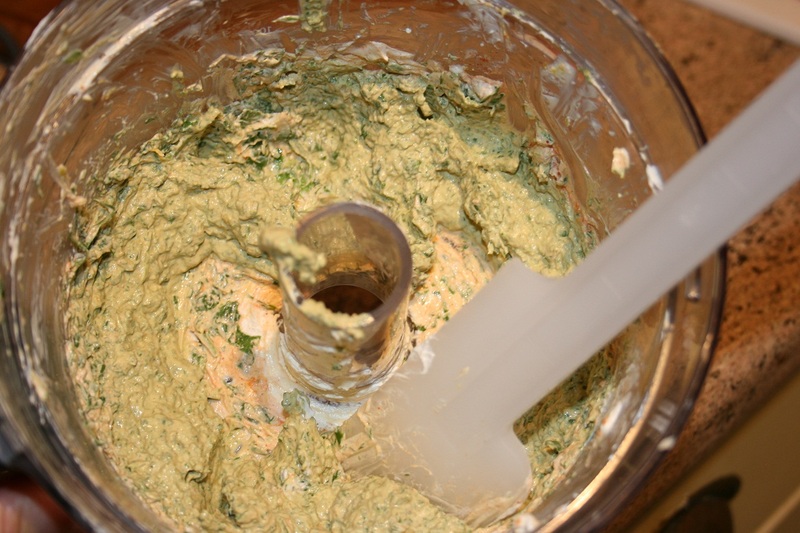 Then, after washing your hands, get stuck in with your fingers and mix it all together. Fill the cavity of the chicken, making sure you’ve removed the giblets. Depending on how big the bird is, you might have some stuffing left over. 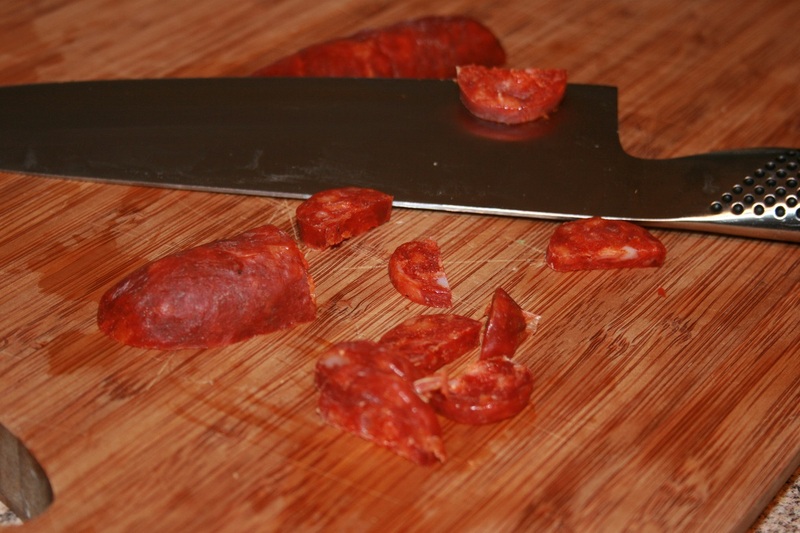 If you do this makes an awesome burger or delicious meat balls. 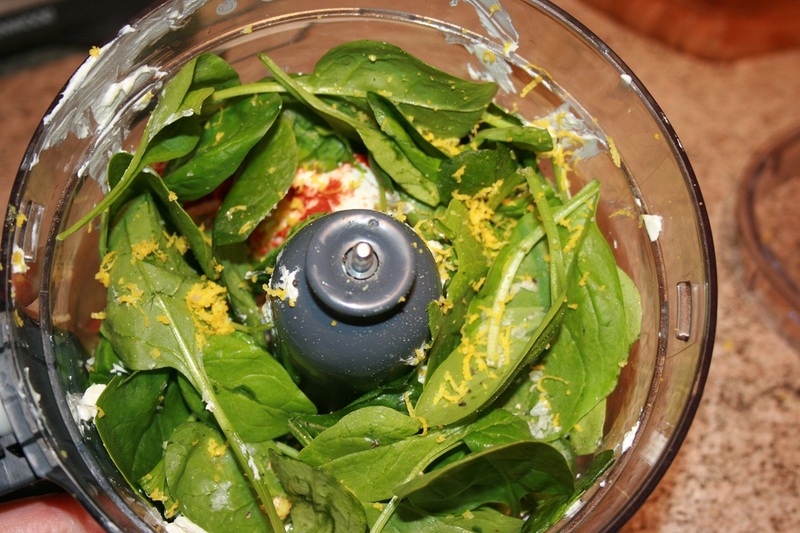 In a separate bowl mix the lemon zest, thyme for the chicken and the butter together, until well combined. Then stick your fingers beneath the skin at the neck of the bird and loosen it. Take the butter put it in the space between the skin and the chicken breast. 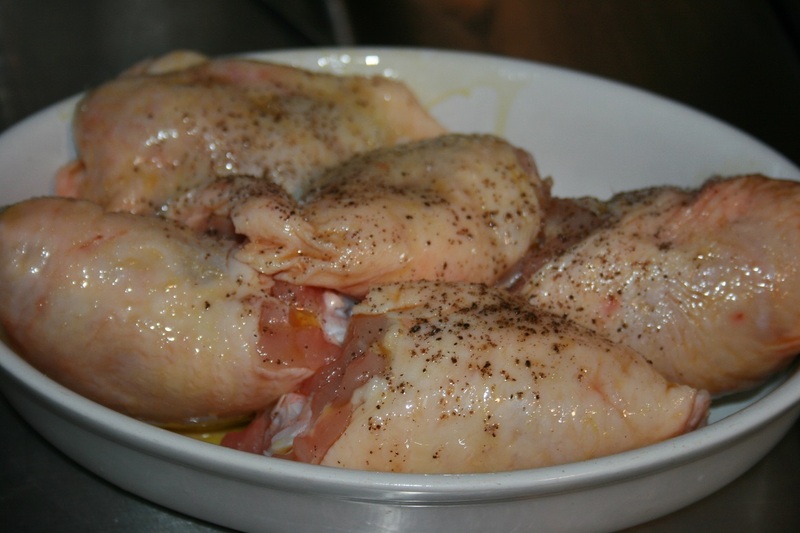 Rub whatever is left on top of the chicken. 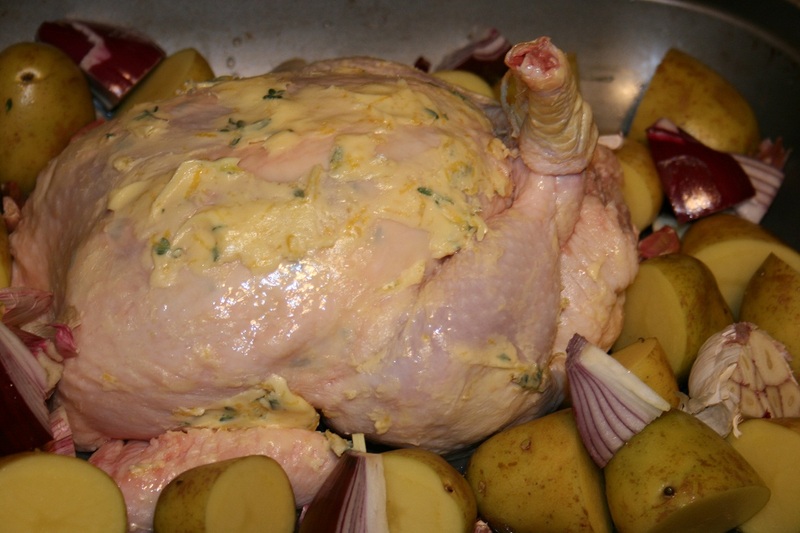 Is is possible to take an attractive picture of an uncooked chicken? I don’t think so. Ah well, put the chicken in a roasting tin and add the wine, the stock, the garlic and the onion and cover tightly with tinfoil. Put it in the oven and roast for an hour. Wash your hair, have a glass of wine, read a good book, don’t worry about the chicken. 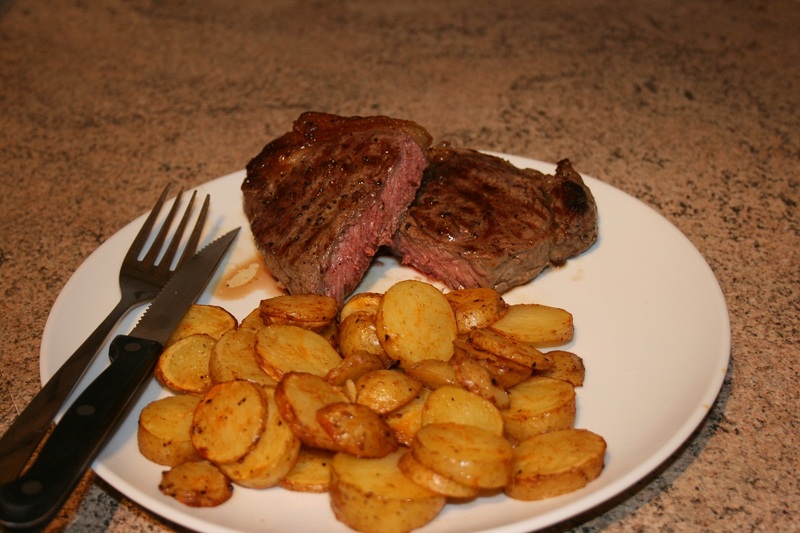 When the buzzer goes, remove the foil and add the lemon, cut into wedges to the tin. Pop it back in the oven uncovered and continue roasting for another fifty minutes. Paint your nails, have another glass of wine, call your BF. When the buzzer goes turn the oven temperature up to 200°C and continue roasting for another half hour. 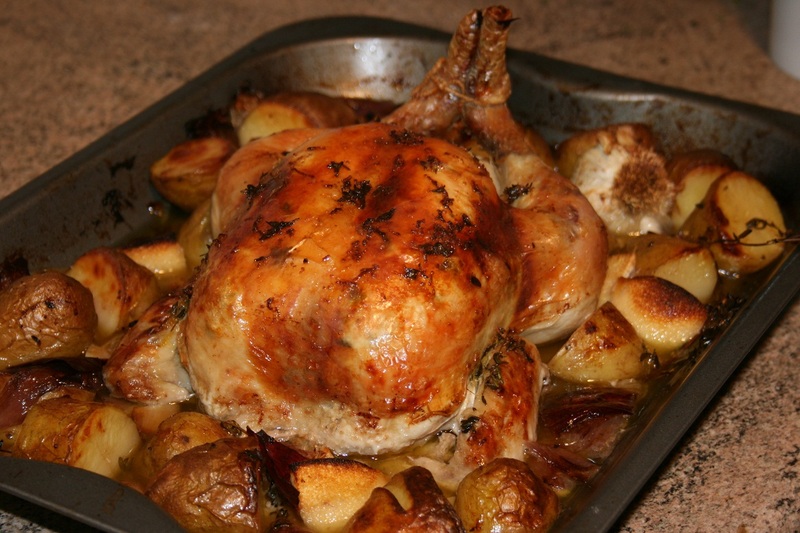 Take the chicken out the oven and await praise and adulation. I adore quiches. I really do! I know that makes me sound like a 1970s housewife, but I don’t really care. They’re tasty, they’re versatile, they look good on the table and compared to other mains, they’re surprisingly good value for money. 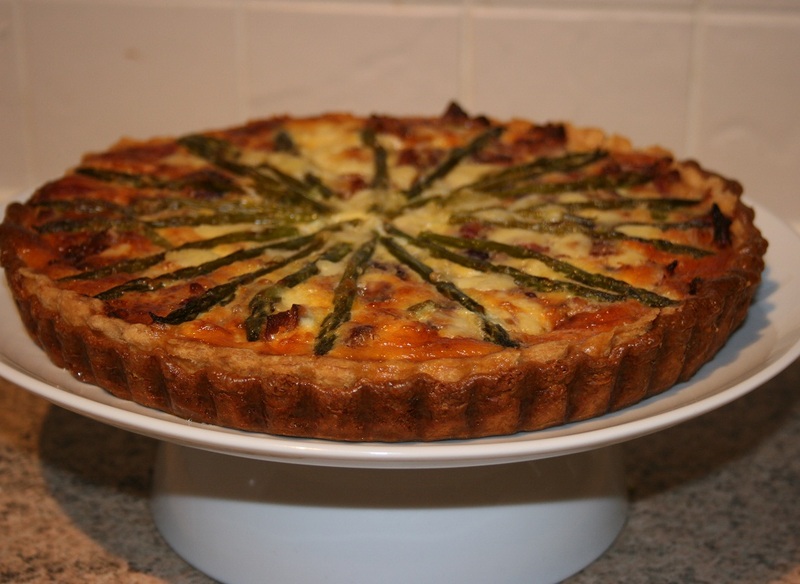 They’re also the perfect way to showcase spring’s asparagus! Many moons back, when I was a veggie, quiches were my “go to meal” when entertaining, as veggies and carnivores alike enjoyed them. That said it’s been many moons since I last made one. While they’re super easy and economical, they are fiddly and demand quite a bit of kitchen time and a lot of waiting time. It’s one of those dishes that demand a good book. It’s not something you’ll whip up when unexpected guests pop over. Does that still happen by the way? I can’t remember when I last had unexpected guests. We’ve become far to polite as a society to dare drop by without phoning ahead. I think we should campaign to bring back the unannounced visit. BUT I digress. To start, sift the flour with the paprika and and then mix in the butter. 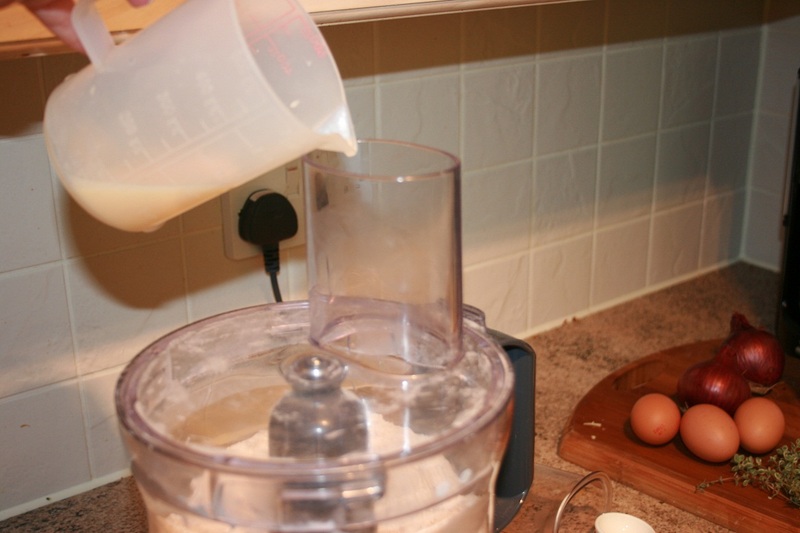 You could use a pastry blender, your hands or a food processor. I prefer to use a processor as it’s quick and you don’t have to worry about the heat from your hands melting the butter. 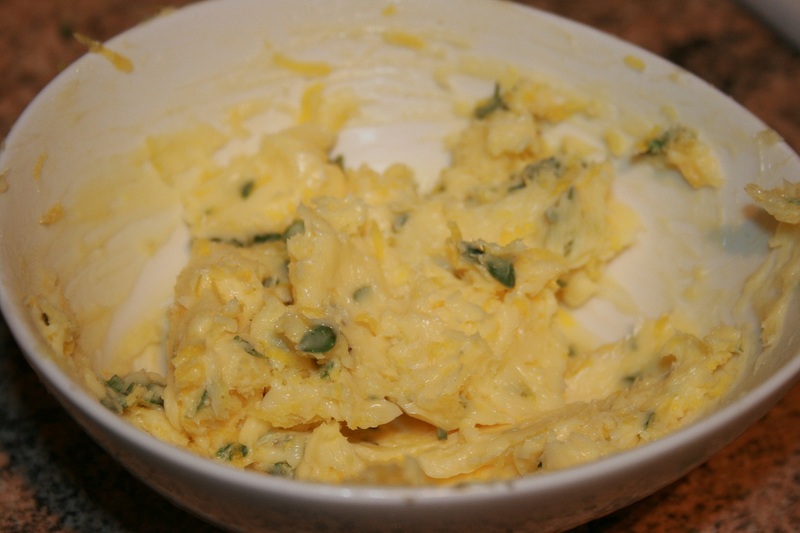 Mix them until just starting to resemble crumbs and then add the yolk and as much water as you dare. 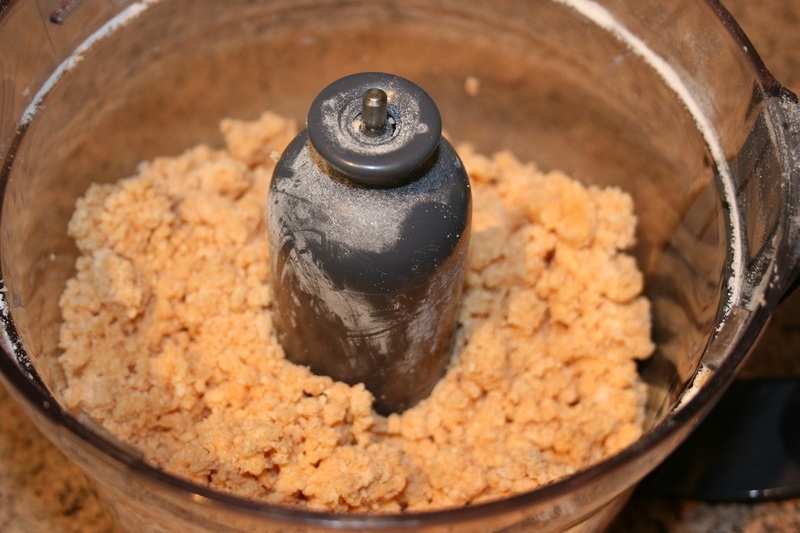 The mixture should resemble the mix below. The less water you use the harder the dough will be to work with, but it will have a much shorter texture. 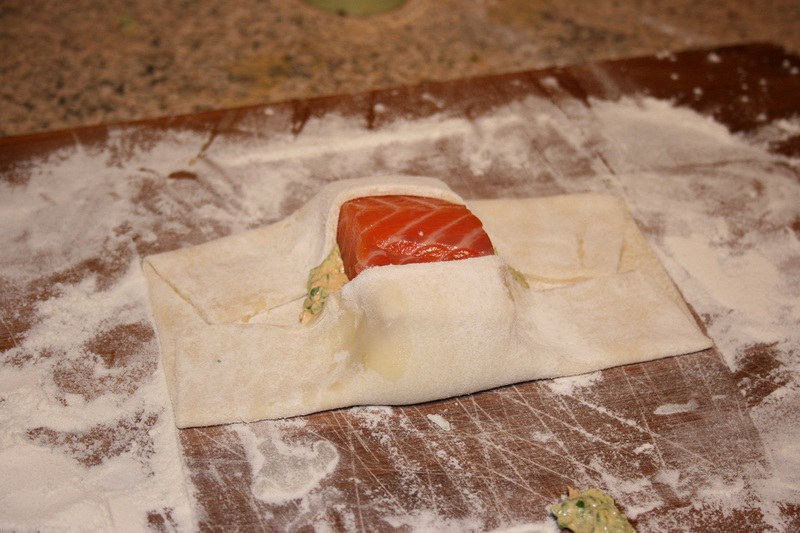 Wrap the dough in cling film and leave to rest in the fridge for half an hour. 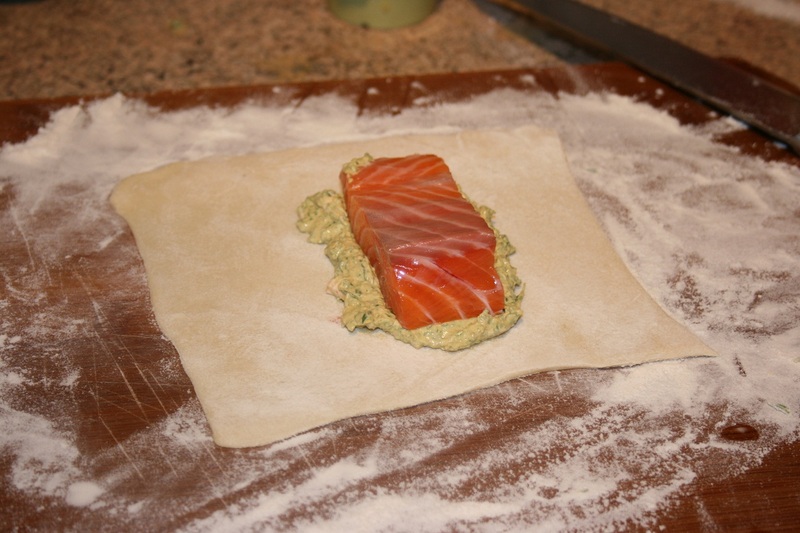 This allows the gluten to relax, which stops the crust from shrinking as much when it is baked. 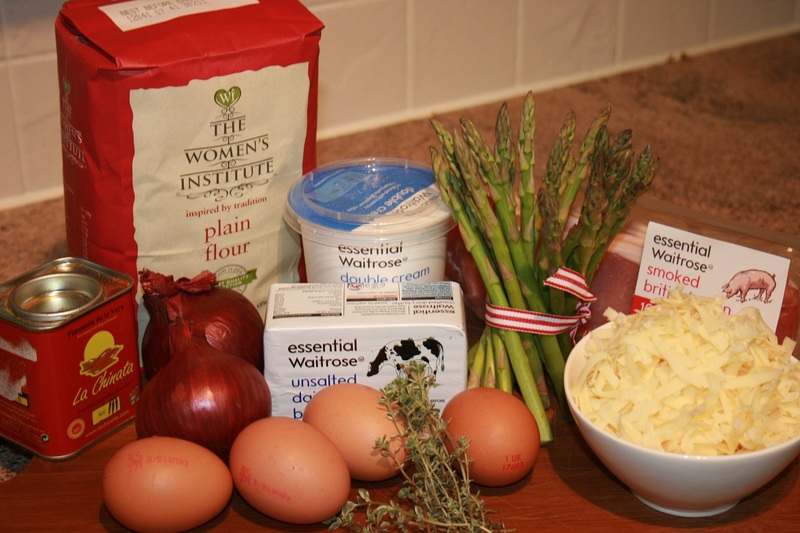 After half an hour preheat the oven to 180 °C and remove the dough from the fridge and place on a lightly floured surface. 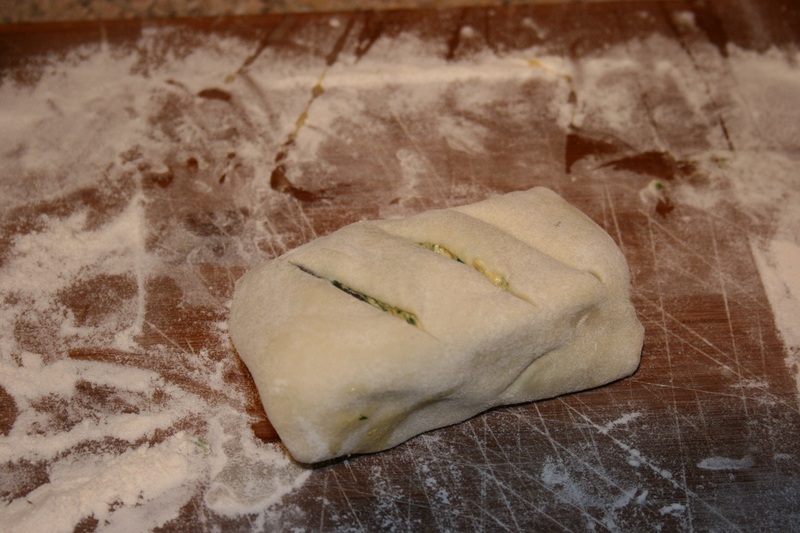 Kneed the dough for a minute or two and then roll it into a rough circle. 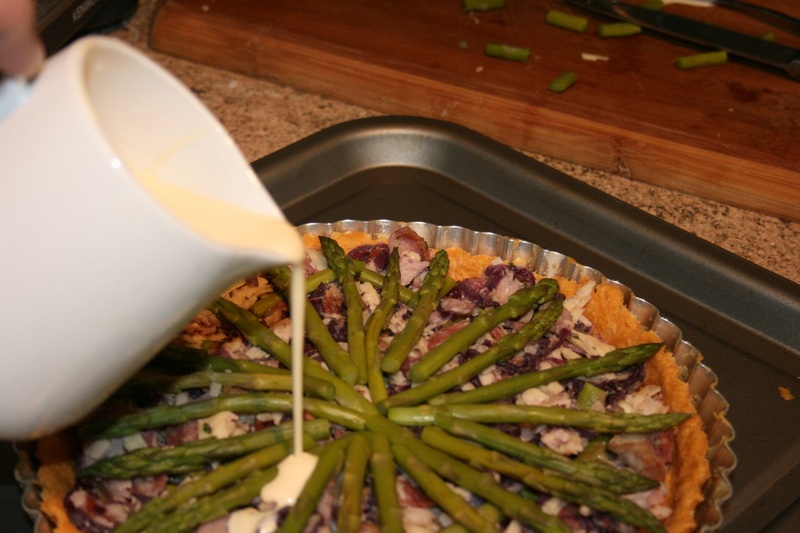 Then place the dough into a greased and floured quiche tin. Press it firmly into the tin and then let it rest for another half hour. 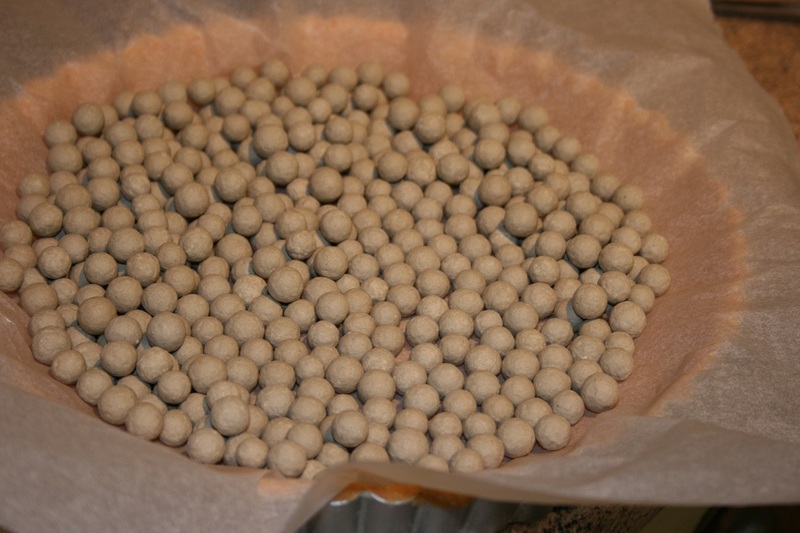 Once the dough has rested, line the tine with parchment paper and baking beans and bake it for 20 mins. Remove the beans and then continue to bake for another 10mins to crisp. Remove from the oven and let it cool. 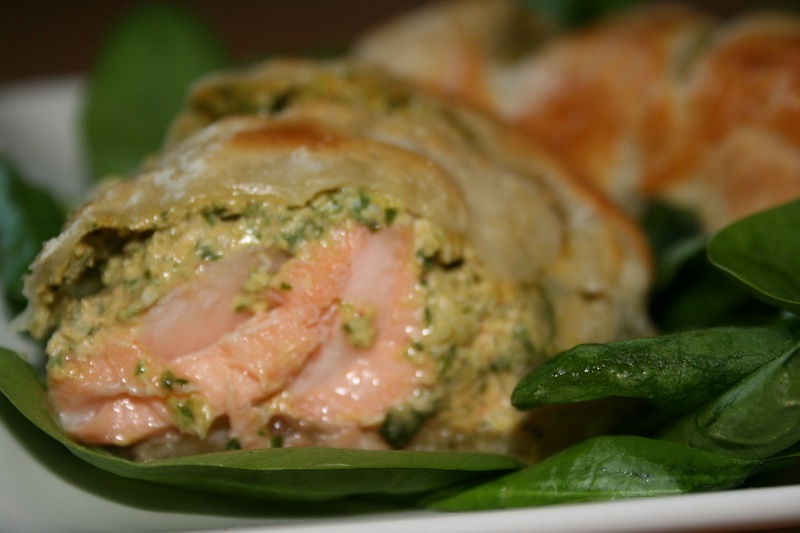 This, while the crust is baking, it the perfect time to prepare the filling. Lightly steam the asparagus for about 10 minutes and grill or fry the bacon. 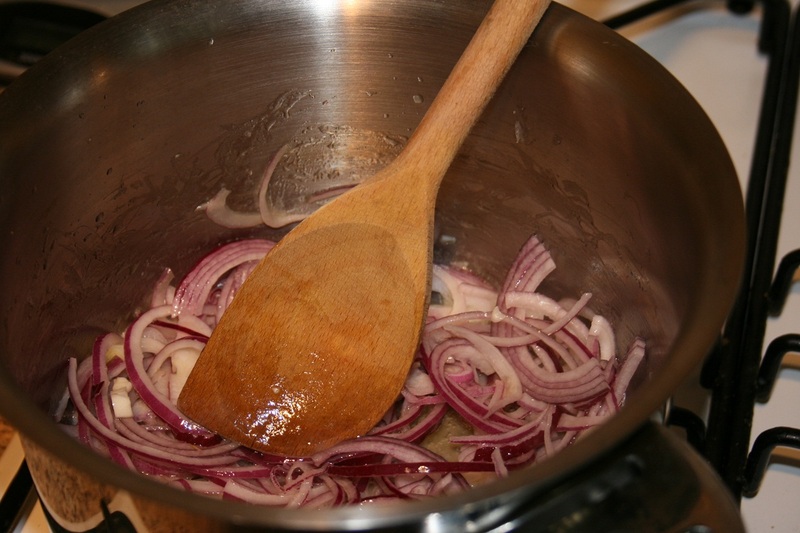 Over a very low heat, melt the butter in a pan that has a lid and once melted add the sliced onions and the thyme. 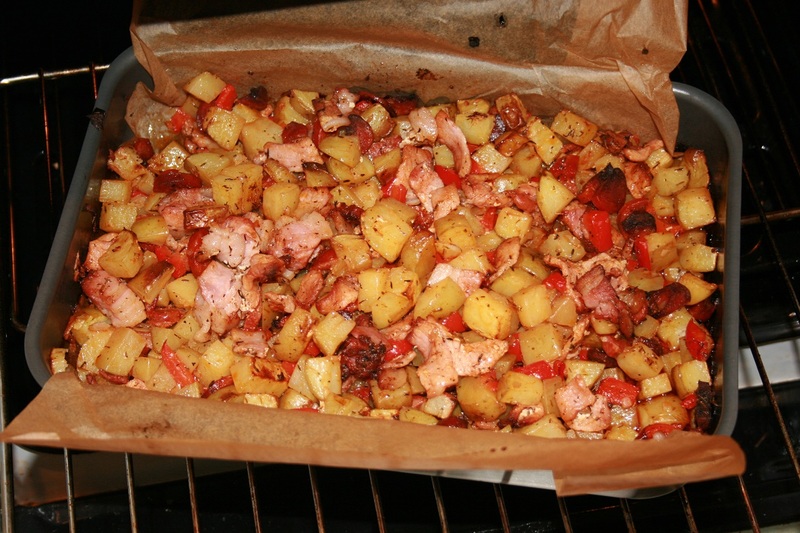 Cover them and allow them to cook slowly for about 20 mins until just starting to caramelise. Stir occasionally to prevent them from catching. Once they are just starting to brown, remove them from the heat and add the bacon and the cheese. 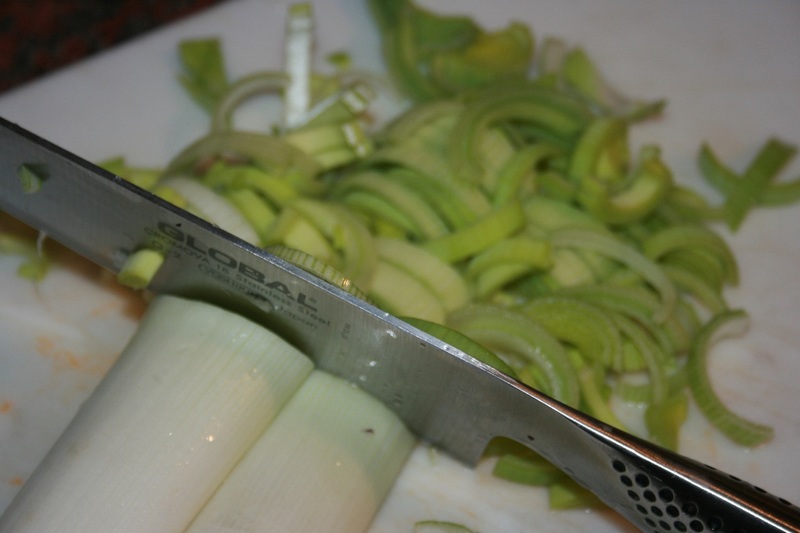 Once the pasty has cooled place the onion mix in in and arrange the asparagus on top. 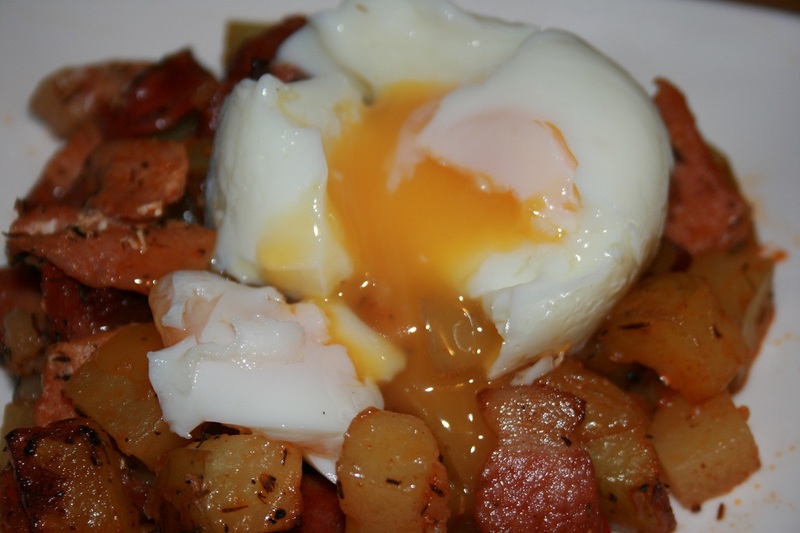 Then beat two eggs with one egg yolk and the cream and pour over the top. 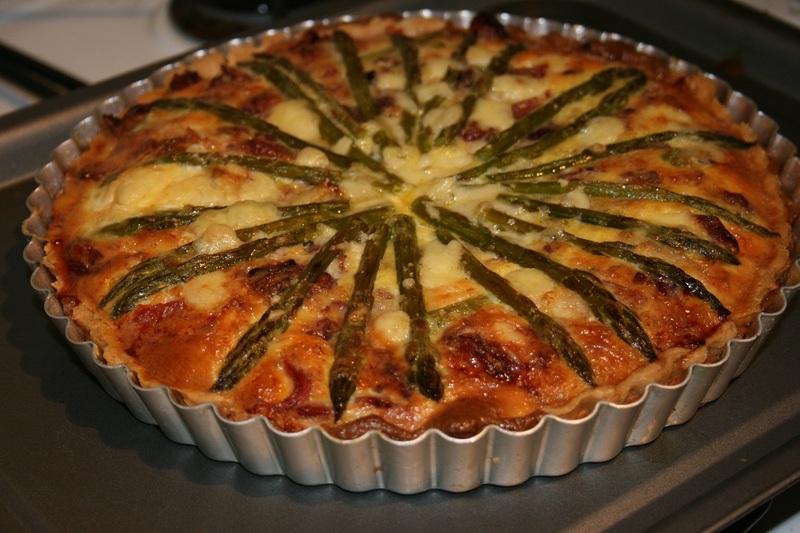 Then pop the quiche into the oven, still set at 180°C and bake for about 30-40 mins. The middle should have the slightest of wobbles and the top should be brown and poofy. Enjoy! At least once a year I manage to fool myself into buying a jar of pasta sauce. Usually when I’m pressed for time. 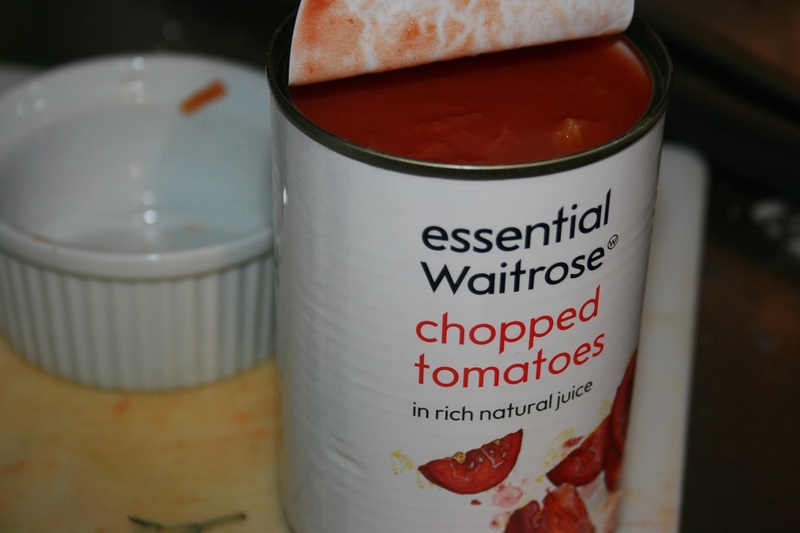 I’ll pick up a jar and fall prey to descriptions of juicy tomatoes and fresh basil and before I know it the jar has been popped into my basket. Then, when it comes time to use it, I’m always hugely disappointed. The flavours never really come through. I think the reason this upsets me is that I know how easy it is to whip up an amazing sauce in the time it takes to cook the pasta. If I’m really in a rush, I will literally just roast tomatoes and garlic together and then blend them with some aged Pecorino and some fresh basil. If I have a little more time on my hands, I make this sauce. 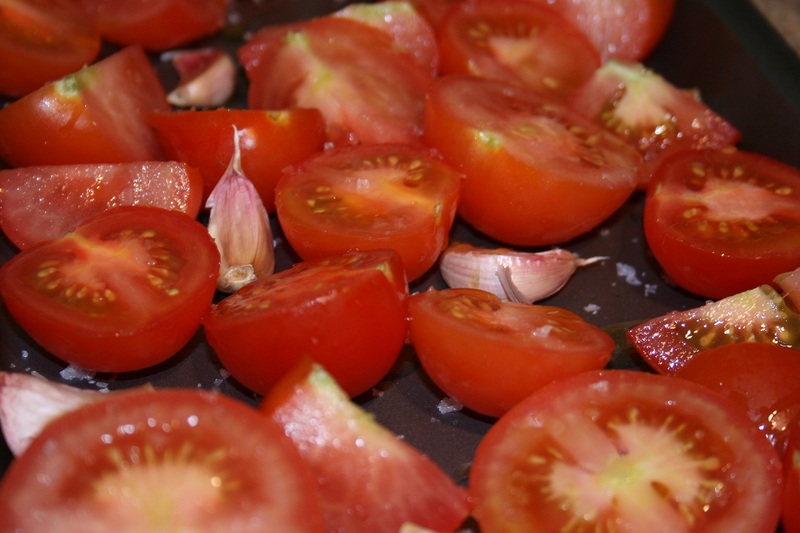 Cut the tomatoes in halves or quarters and place, with the garlic cloves, skins still on, on a baking tray. 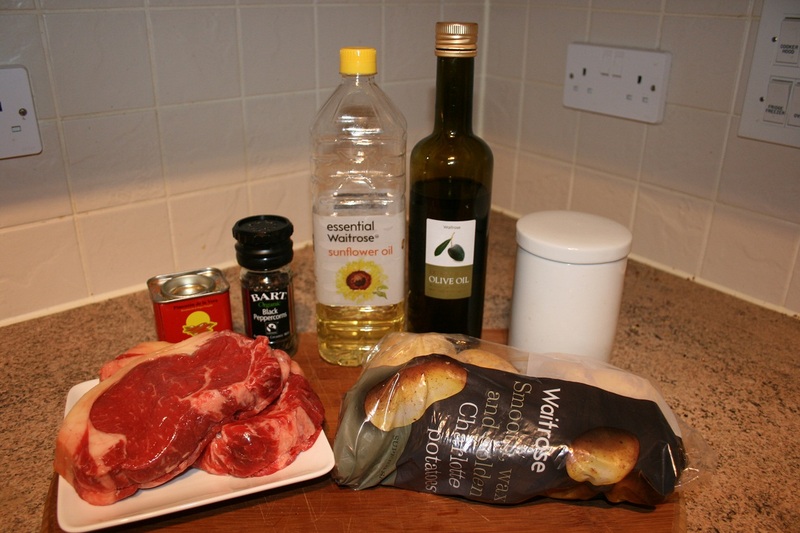 Drizzle with olive oil and sprinkle with salt and then roast at 200°C for about 20-30 mins. 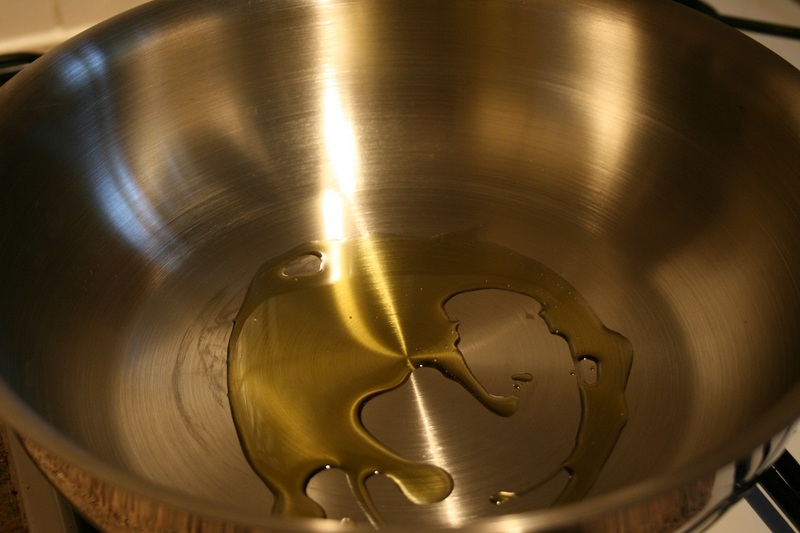 Pour a good glug of olive oil into a medium pot and bring to a low heat. 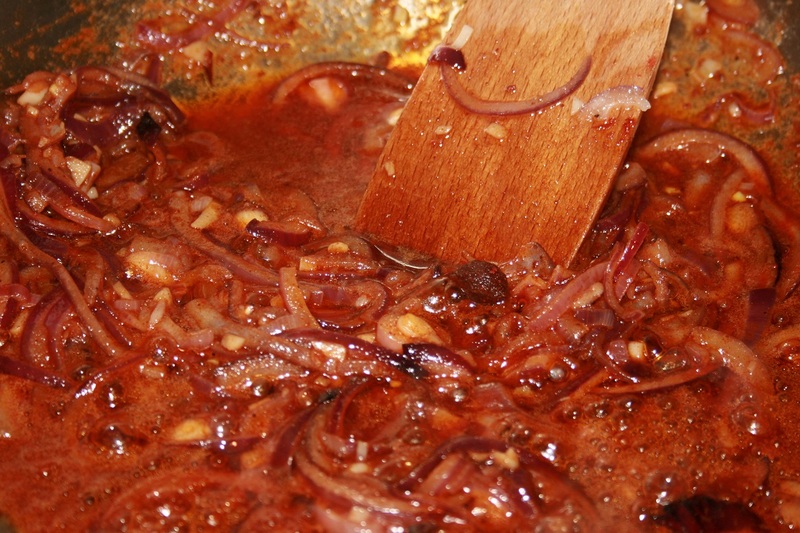 Then add the finely sliced onion and allow it to cook slowly for about 20 mins until just starting to caramelize. 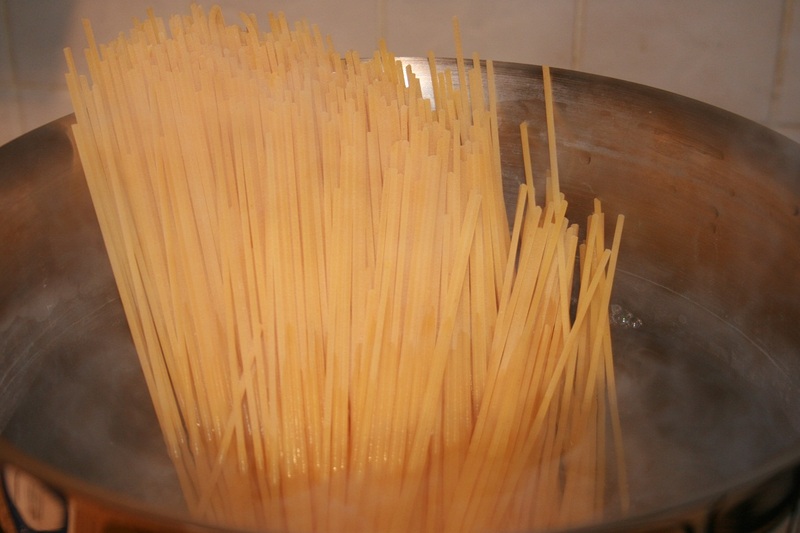 Now would also be a good time to start bringing a large pot of water to boil to cook the pasta. 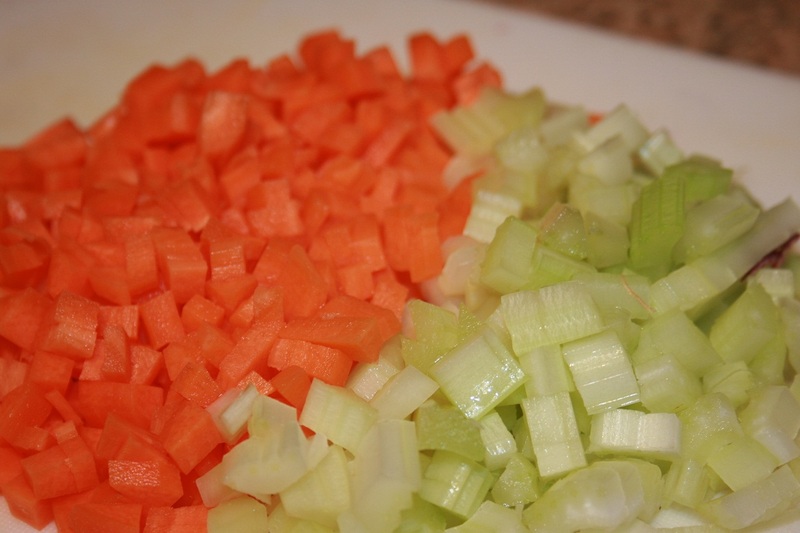 Dice the carrot and celery as finely as you can and add to the just starting to caramelize onion and allow to cook for a further 5 mins. 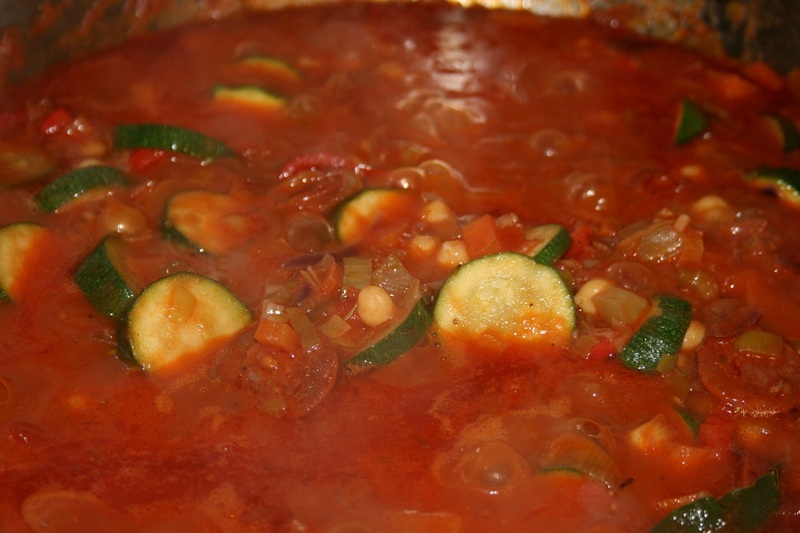 While the carrot and celery are cooking, remove the roasting tin with the garlic and the tomatoes from the oven. 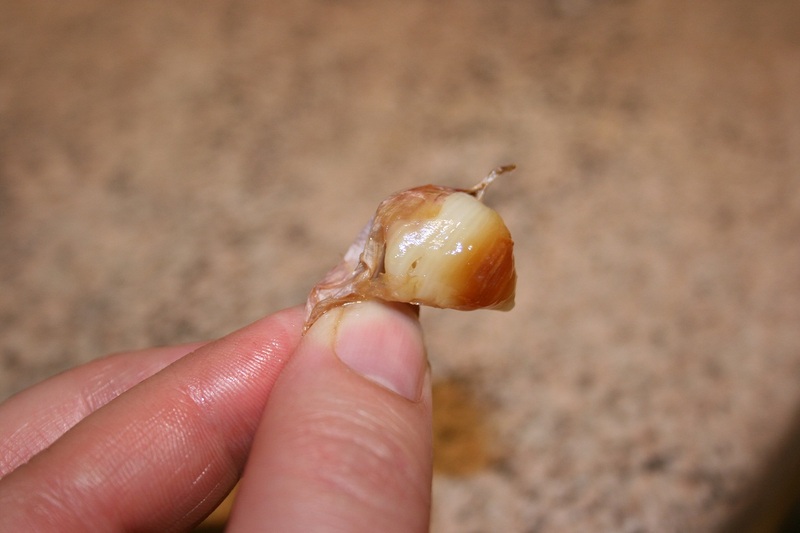 Once the garlic cloves have cooled slightly, grab them from the base and squeeze the garlic out of it’s skin. 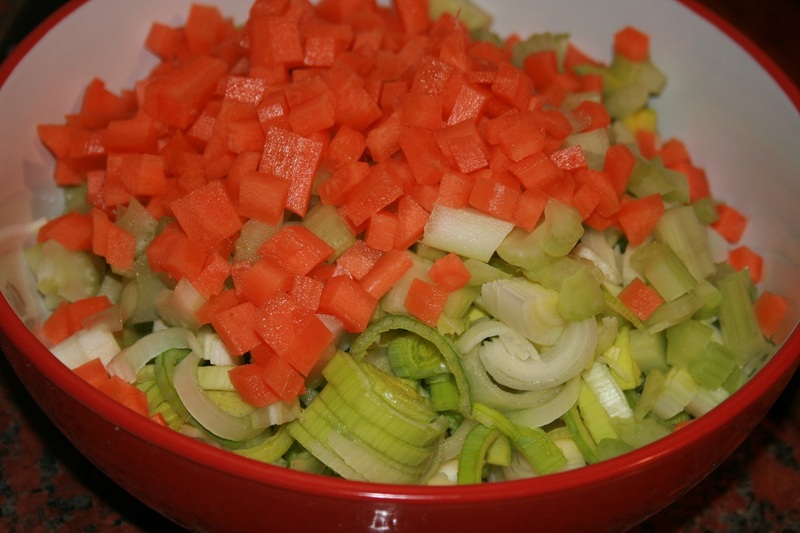 Add this and the tomatoes to the onion, carrot, celery mix. 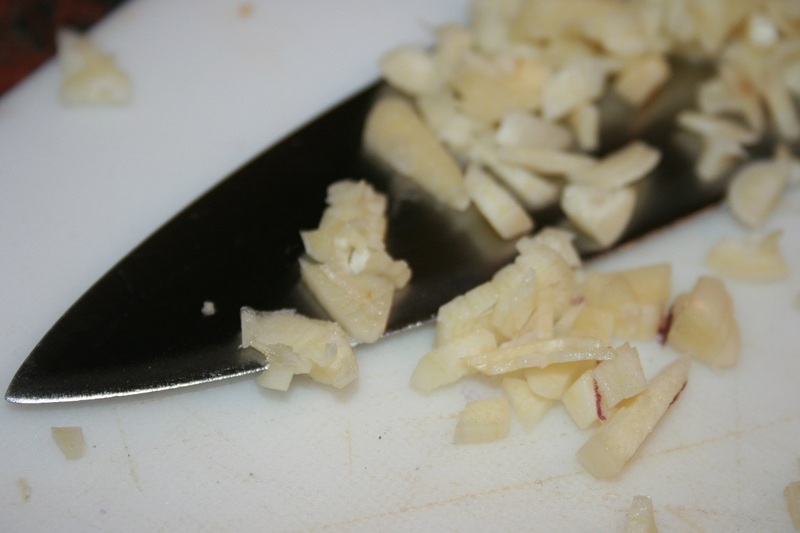 Don’t be alarmed at the number of garlic cloves. 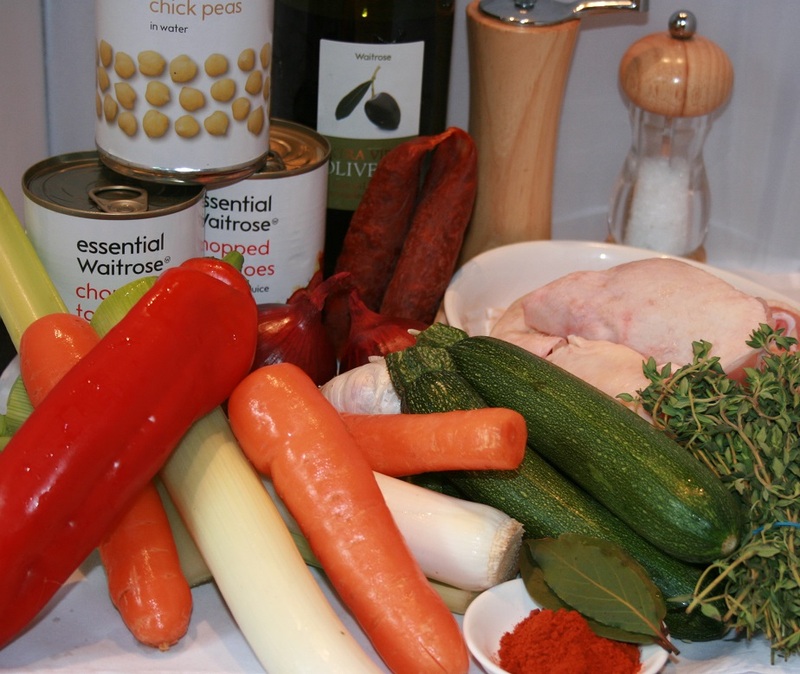 They will have softened in flavour during roasting. 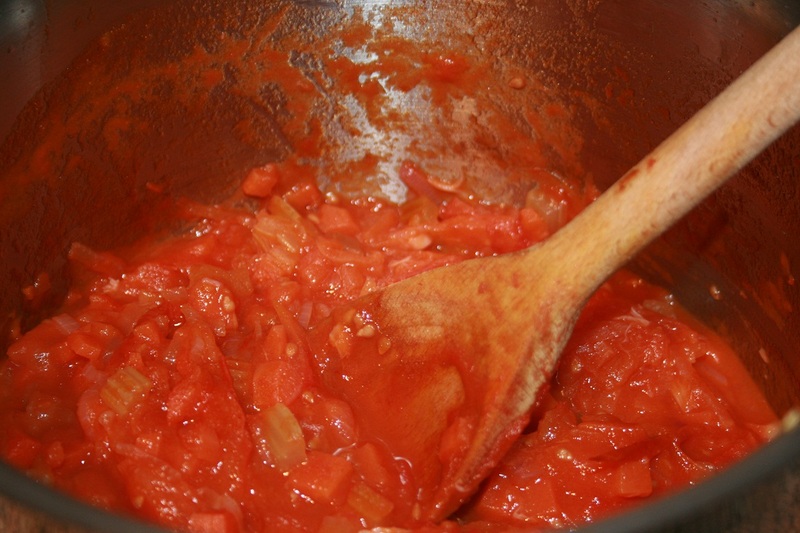 Now add the wine and tomato puree to the mix and leave it to cook for another 10 – 15 mins, until it resembles the picture above. 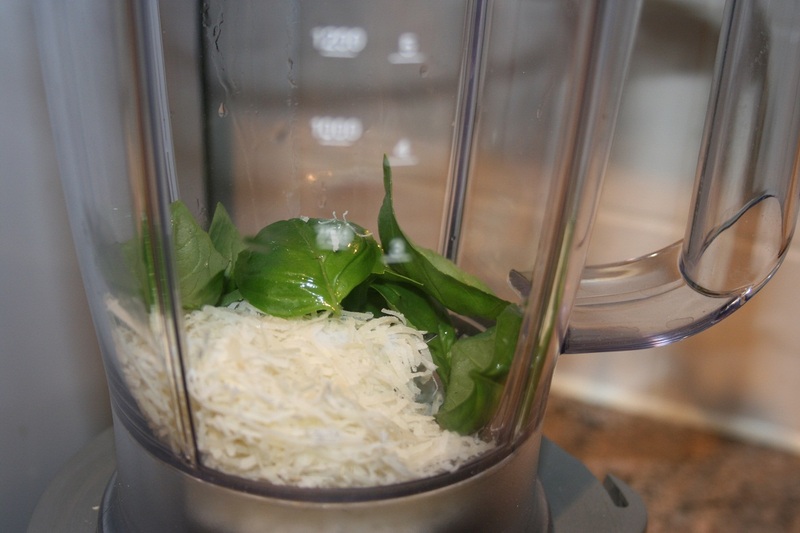 Add the basil and cheese to your blender and then top with the tomato sauce. Whiz them together until smooth. Cook the pasta as per the packet instructions and then drain the pasta in a colander and put back into the pot it was cooked in. 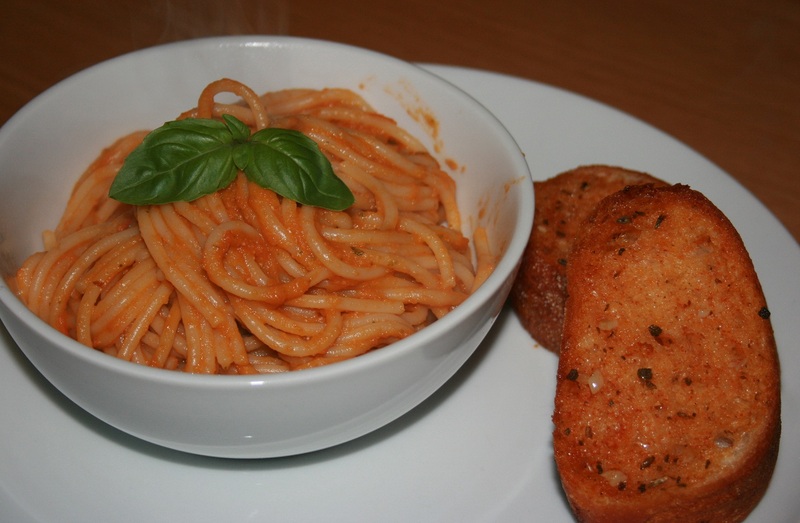 Top with the tomato sauce and serve with some crunchy garlic bread. 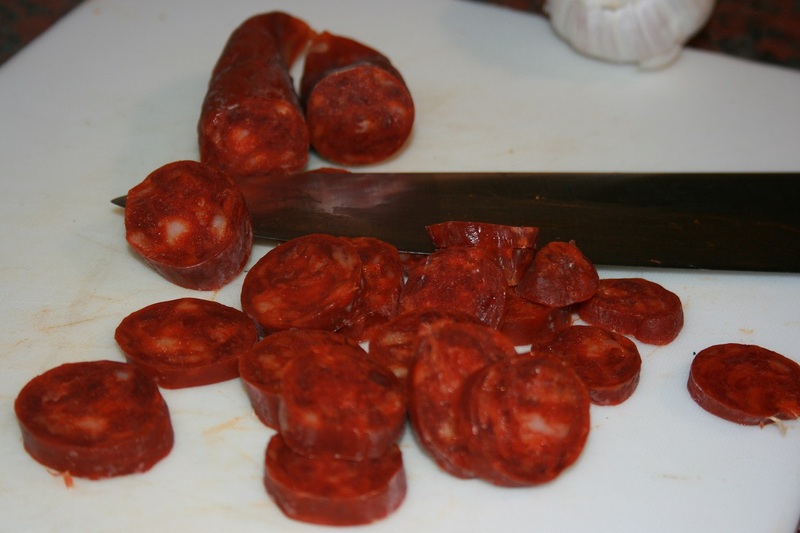 Simple and seriously tasty! Sorry, it’s been a while since I last posted. 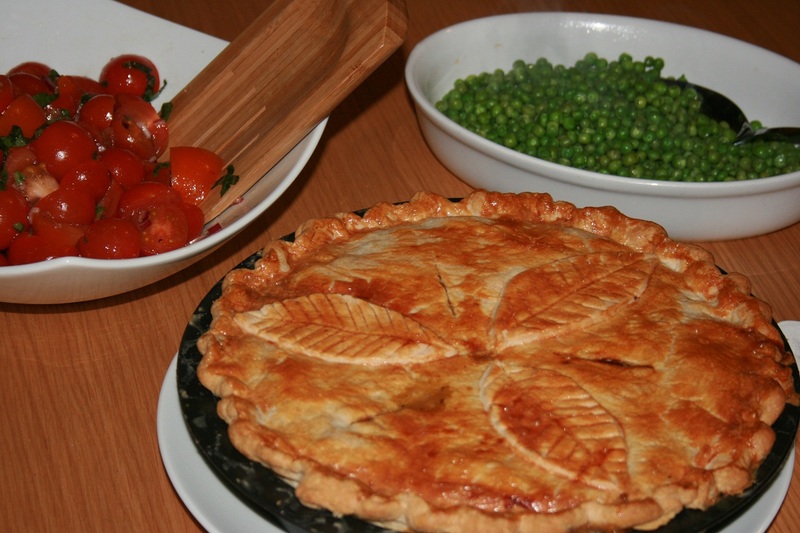 Time has not been my friend this week and speaking of weeks, this week is British Pie Week! Now my better half, BH, has a more than serious little pie addiction. In fact I still believe one of the reasons “we” chose to settle in the UK is how readily available pies are here. You’re smiling and saying she must surely be joking, but this is a man who spent an entire road trip in search of the perfect chicken pie. It of course, had to be a chicken pie. 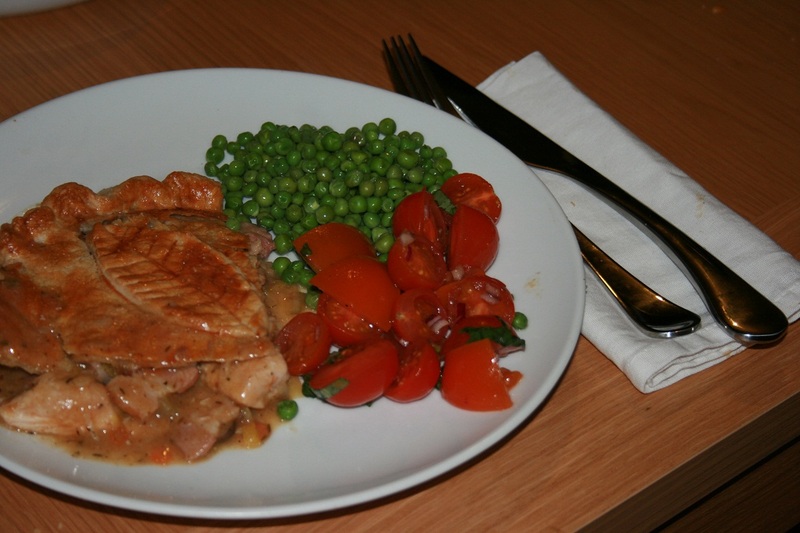 The chicken pie is to savoury pies what the apple it to sweet, the pie standard if you will. The judging criteria were strict, that it had to be tasty went without saying. The pastry had to be fluffy and light. There had to be more filling than sauce and solid chunks of chicken rather than tiny shredded bits. 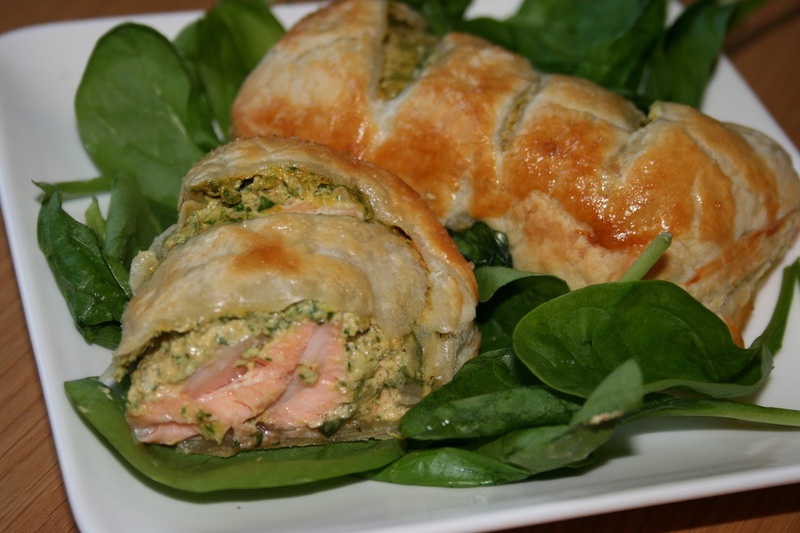 Potatoes, peas and any other ingredients used to bulk up the filling were a strict no-no. The final factor was that it had to be awesome hot as well as cold. The winner, by the way was the Steam Whistle Stop Shop in Sedgefield. 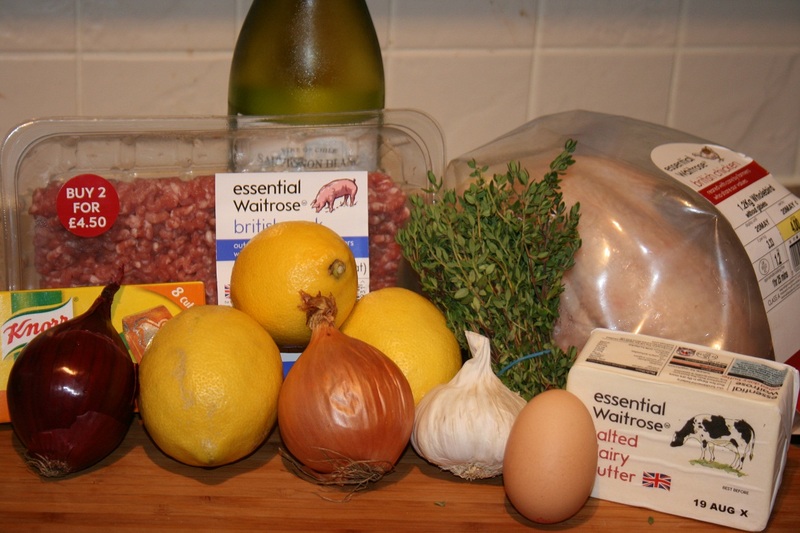 Below is my attempt, not to recreate the winning pie, but to meet all the criteria and kick its arse! 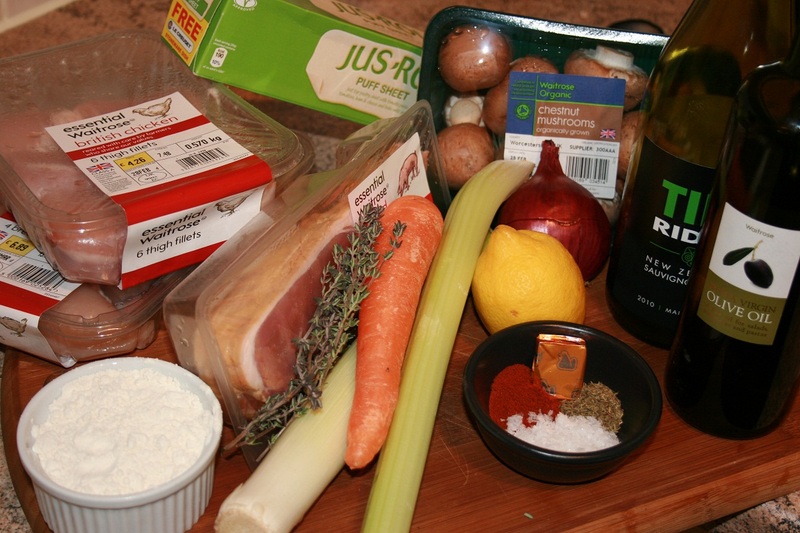 First rustle up some ingredients. In the interest of saving time at a later stage, I always make enough filling for two pies and freeze half. 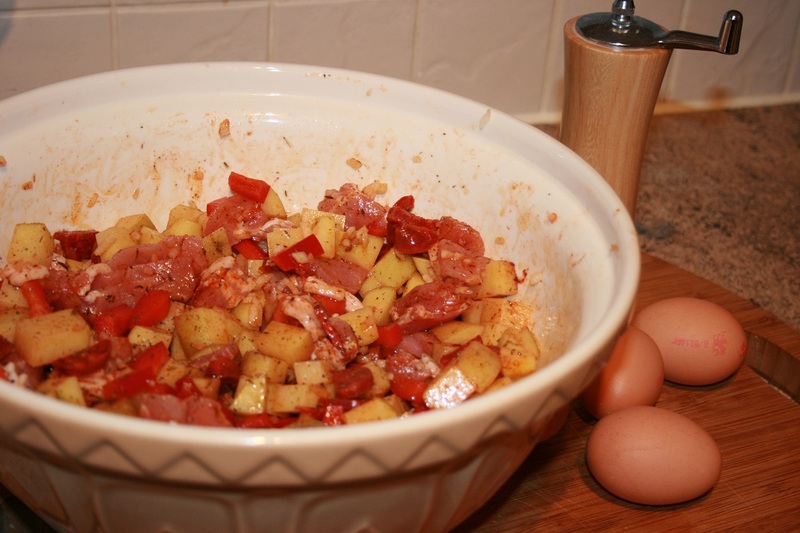 First add a good glug of olive oil to a deap pan and fry the bacon until cooked, but not crisp. 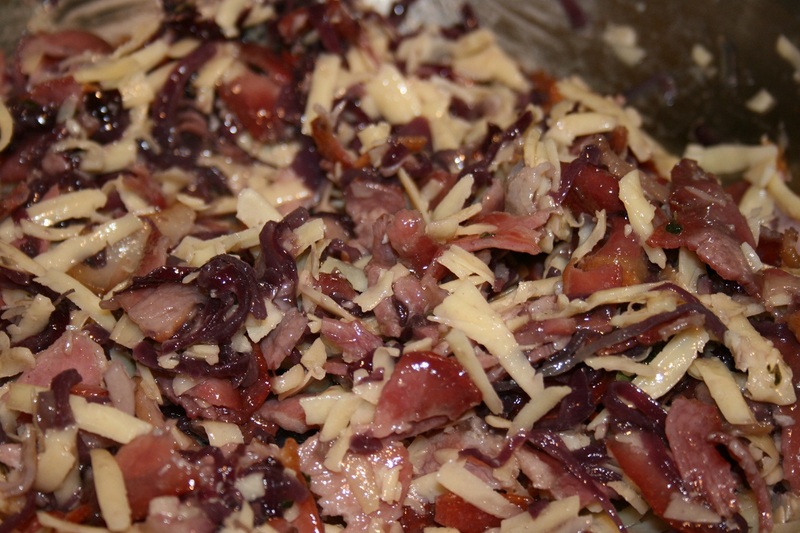 Set the bacon aside in a bowl and fry the mushrooms in the bacon fat. Put the cooked mushroom in the bowl with the bacon. 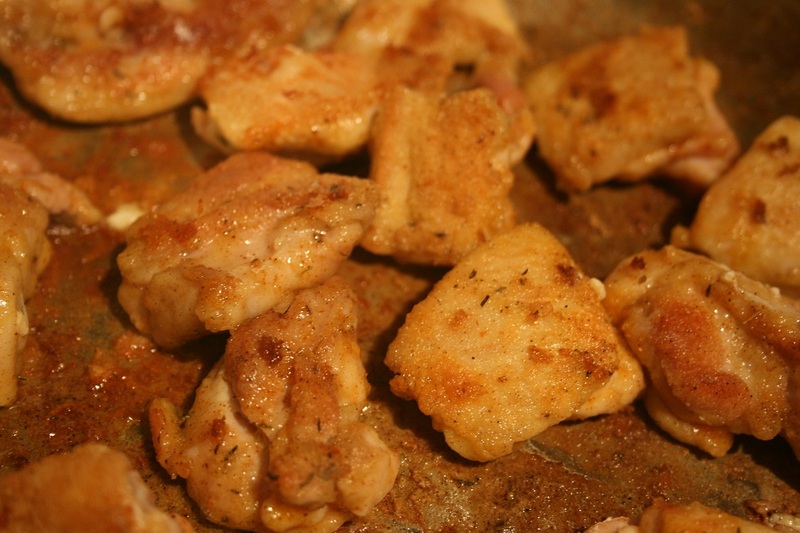 Then add the salt, dried thyme and paprika to the flour and dredge the chicken chunks in it. For maximum shaking fun and minimum mess, I like to do this in a zip lock bag. 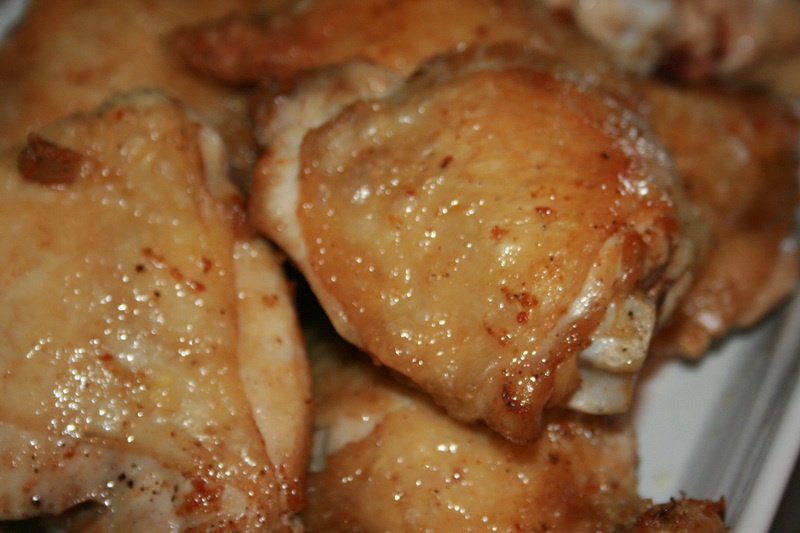 Fry the chicken pieces, on a medium heat, in batches until GBD, that’s golden brown and delicious! 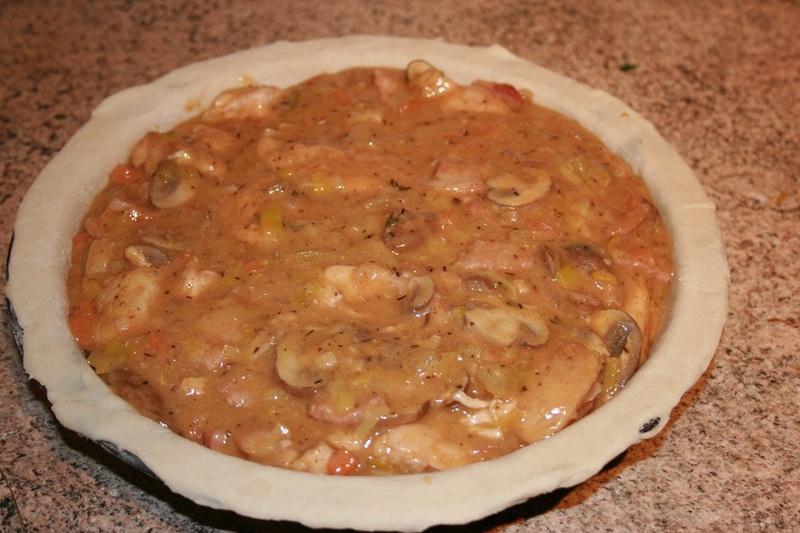 Set the chicken pie chunks aside in a separate bowl to the mushroom and bacon. Now look at your pan. The flour has left it looking crusty and impossible to clean, right? Don’t despair. This is what’s going to make the tastiest sauce ever. 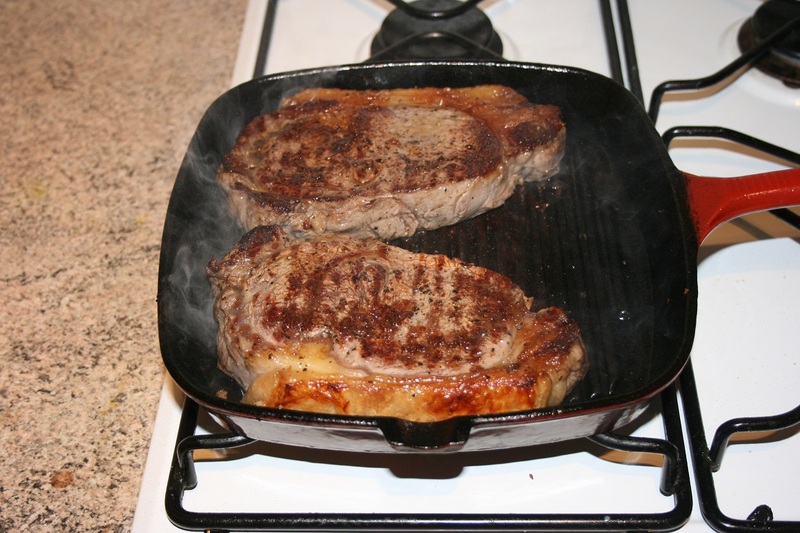 Lower the heat and add the wine to deglaze the pan. 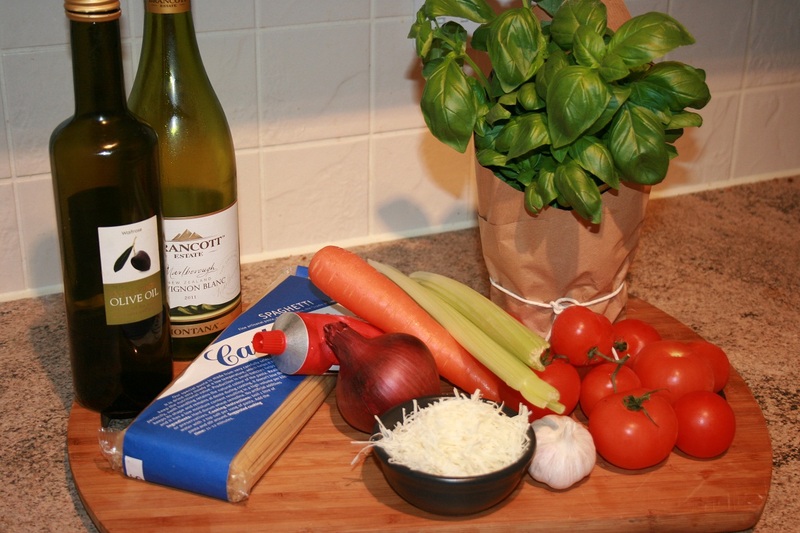 Stir until all those browned bits dissolve into the wine. 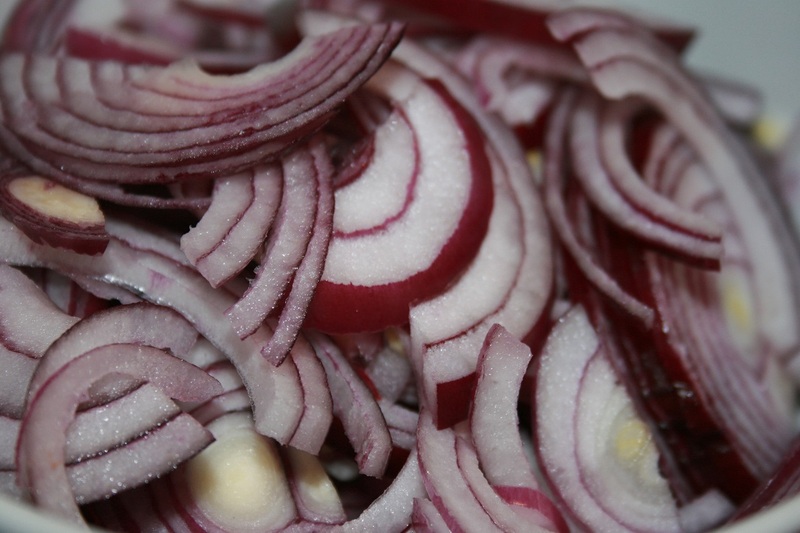 Add the onion to the wine and let it soften for about 5 mins. 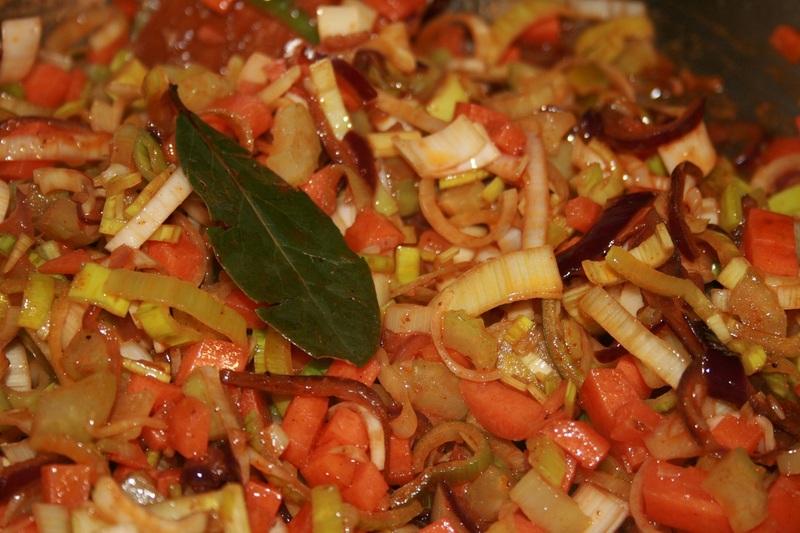 Then add the rest of the aromatics, the leek, carrot and celery, cover the pan and cook for about 10 mins. Add the left-over dredging flour and slowly stir in the chicken stock, lemon juice and zest. 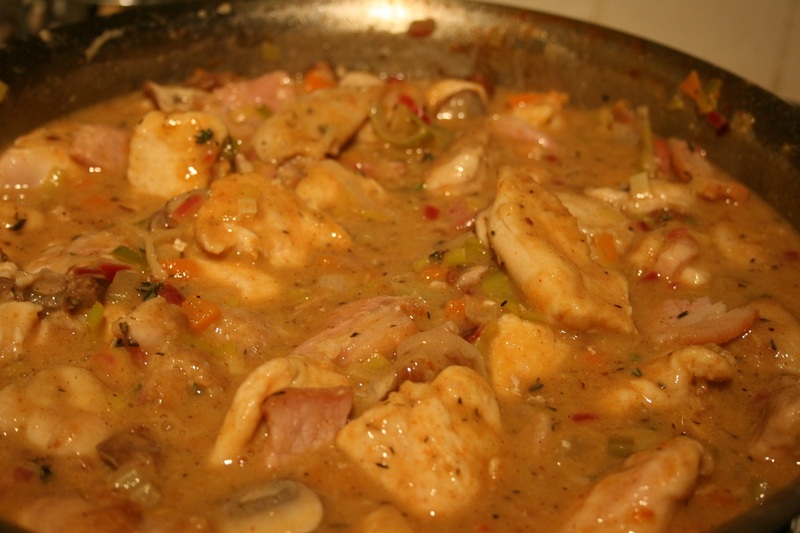 Add the bacon, mushrooms and chicken back to the pan and allow to simmer for about ten minutes. 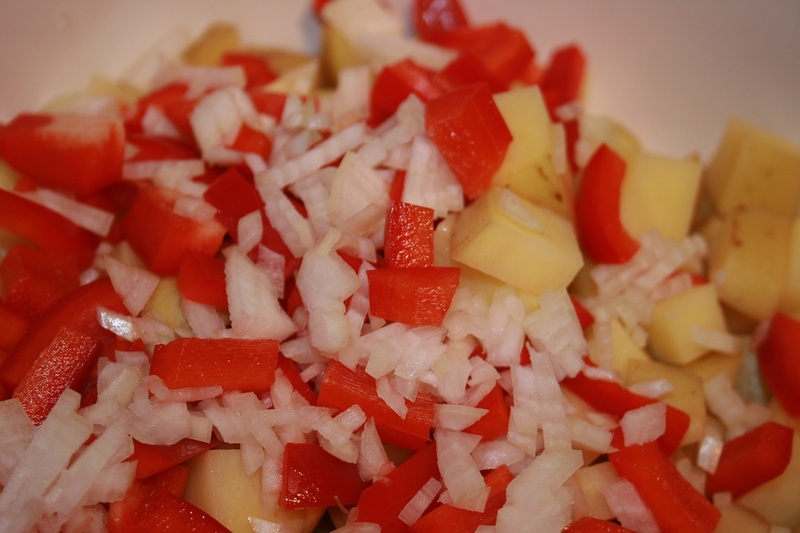 Remove from the heat and allow the filling to cool. 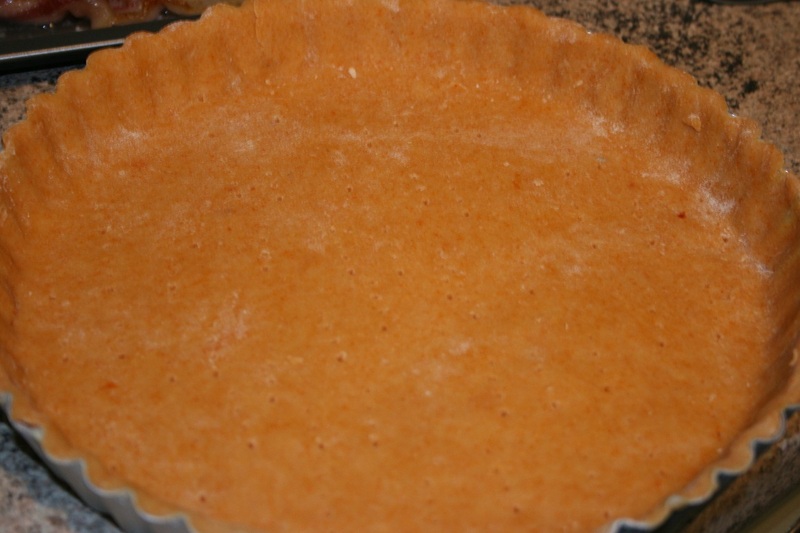 Brush the pastry with egg wash and top the pie with the second circle of pastry. Crimp the edges, cut a few “breathing holes” into the pastry and brush the top pastry with egg. 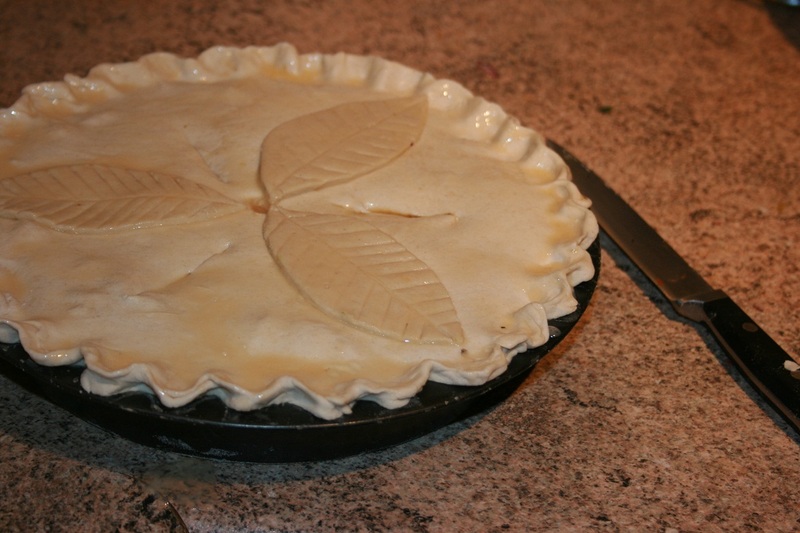 Use the left over pastry bits to cut out shapes to decorate the top of the pie and pop it into the oven for 40 mins. Once the pie is done, take it out of the oven and serve it with something fresh like a tomato salad and green peas to make you feel less like crying when you think of your cholesterol levels. So, how did my pie compare? 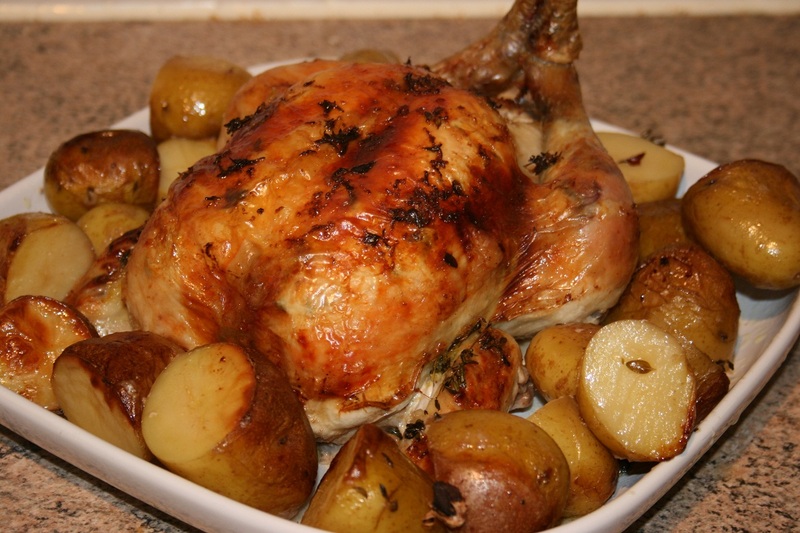 Well thanks to the holy trinity of lemon, thyme and wine invoking memories of roast chicken, BH was impressed with the taste. 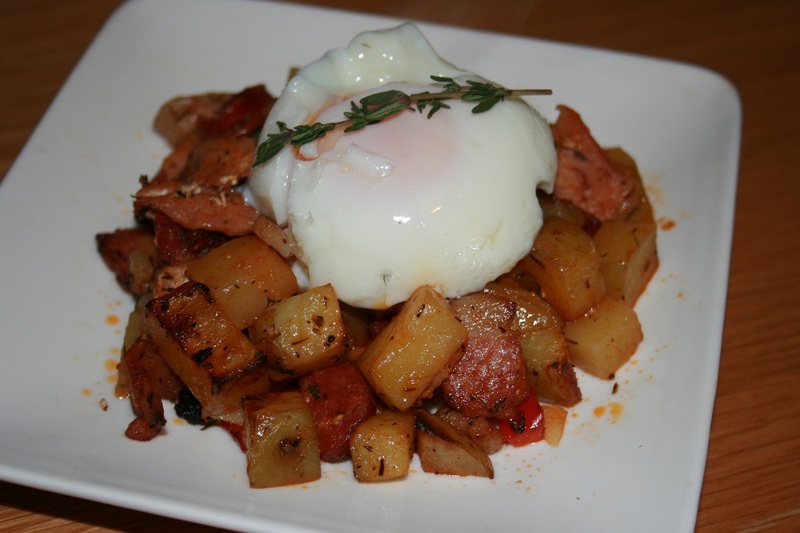 Adding bacon helped with this criterion, because bacon makes EVERYTHING taste better. 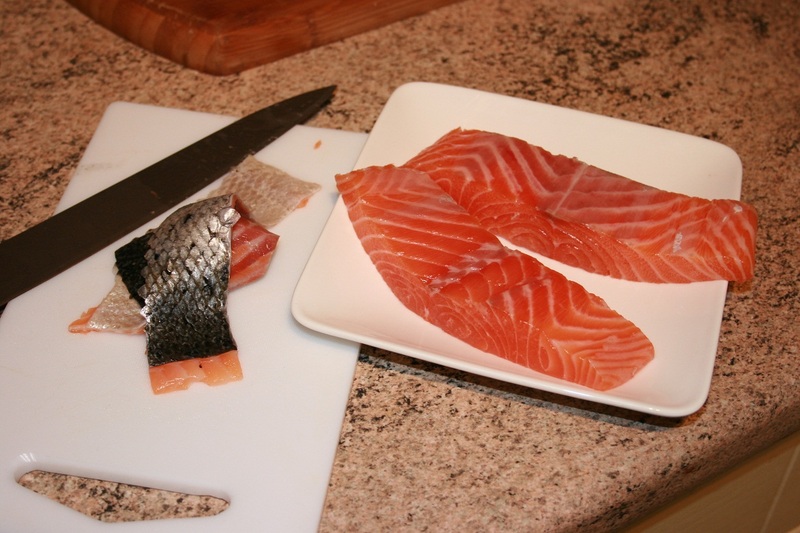 We scored well on chunks and the lack of bulking ingredients. I’d like to take credit for the fact that BH liked the GBD pastry, but my friends at Jus-Rol, get credit for that. In fact it was almost a clean sweep, but we were disqualified right at the end as there was insufficient judging material to judge the pie cold. I guess I’ll just have to make another one, but I think that’s the way BH wants it. Can I claim a moral victory? The BH and I don’t really celebrate Valentine’s day. Why spend a fortune telling someone you love them on Valentine’s day, when you really should be doing it everyday? OK, maybe not everyday, but at least more than once a year. That said, it’s also important to spoil them around this time of year, so last night I offered to make him anything he wanted from the kitchen as his gift. You can imagine how floored I was when he opted for a sandwich, and not just any sandwich, but a VEGETARIAN sandwich. 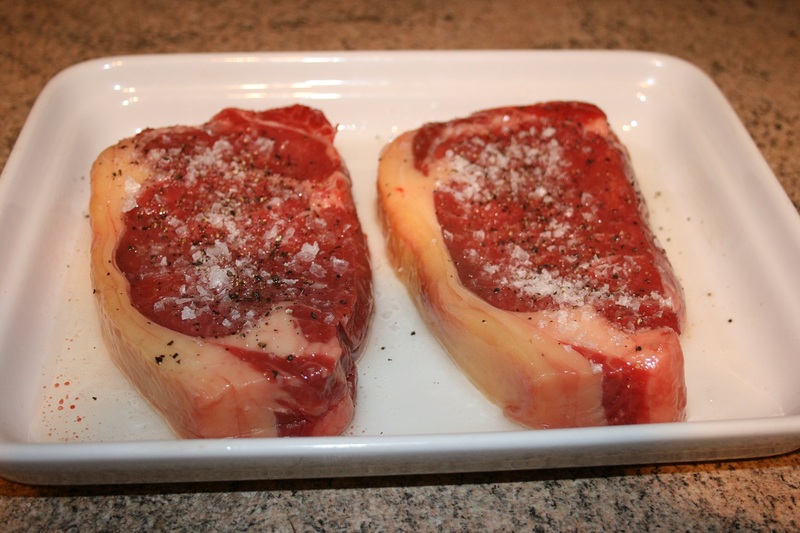 Most people find it hard to believe that the BH and I were vegetarians for over ten years. We just don’t fit the pale, skinny and interesting look most people associate with vegetarians, which probably has something to do with my love for cooking with cream and butter. 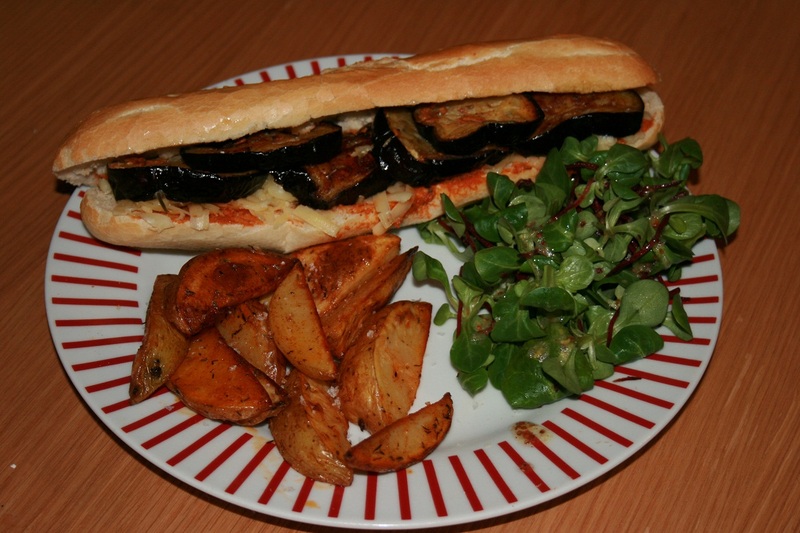 It was during the Vegetarian Years that we went looking for a sandwich that would satisfy the burger craving. Had we been in the West with ready access to quorn, we might never have discovered it. Even though we are now hardened carnivores with all the meat-eating zeal of the reformed, we still enjoy this at least once a month. I hope you do too. There are no exact measures on this one, so go with your gut and eyeball it, to mix metaphors. 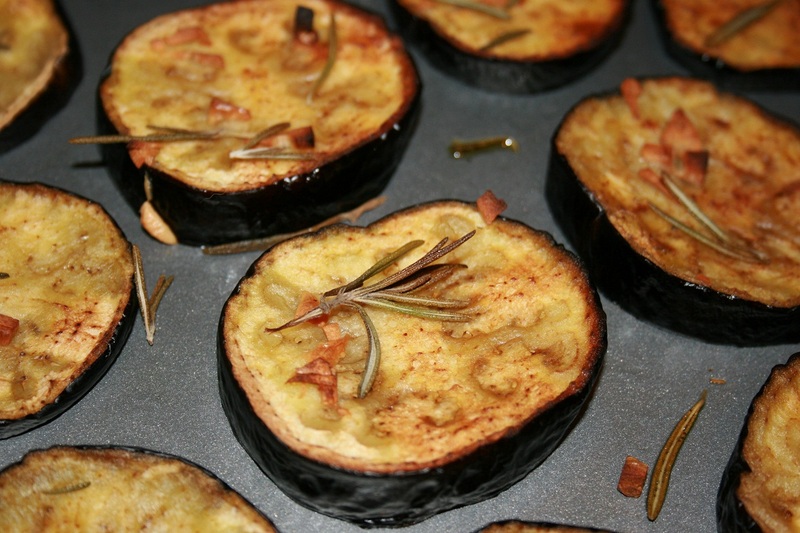 Preheat the oven to 200 ° C. Slice the aubergine in 1cm thick slices an place on an oiled baking tray. 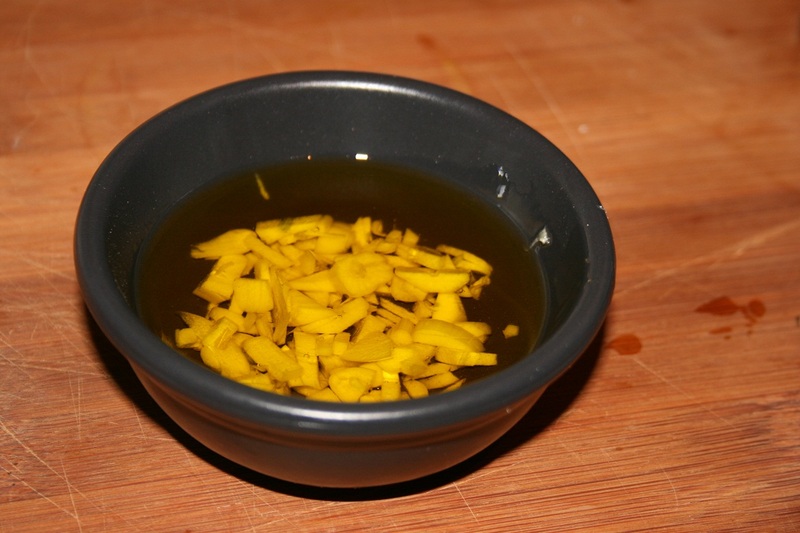 Brush with the garlic infused oil making sure at least one piece of garlic finishes up on a piece of aubergine. In Taiwan I used to use Japanese eggplant which are longer, thinner and less bitter than the aubergines found here, but with the advances we’ve made in food cultivation, I don’t think it’s necessary to peal, salt or soak, this vegetable. Tear up the rosemary and scatter about the tray. 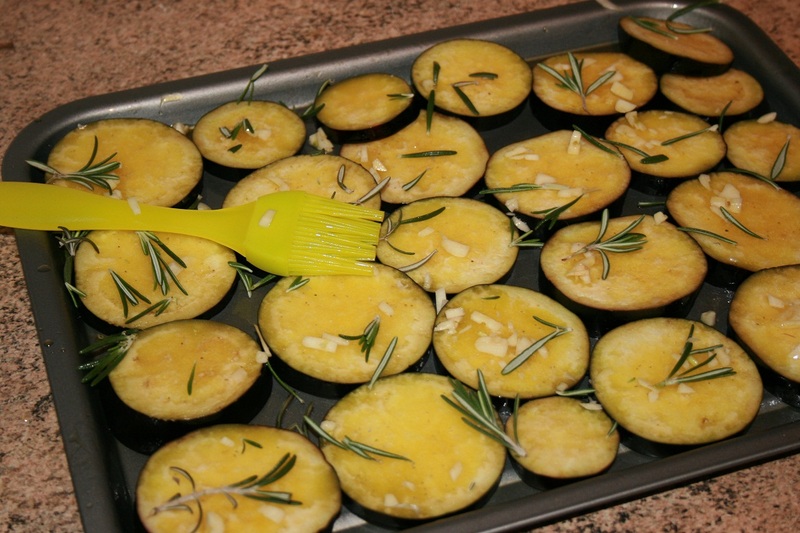 Place the baking tray in the oven and cook for 30-40 minutes until they are soft and golden brown. Slice open the bread and spread the SDT pesto on the bottom and then top with as much cheese as you can. 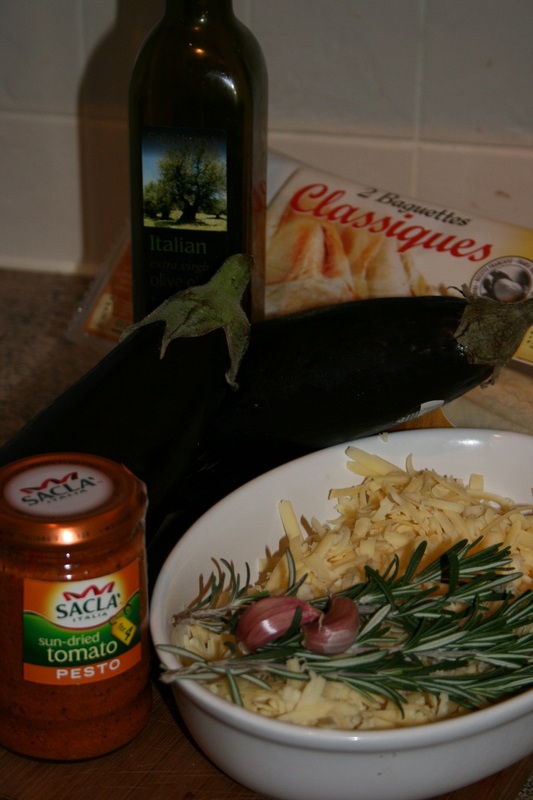 Place the hot from the oven aubergine on top of the cheese and close the sandwich and leave for 3-4 mins so the aubergine melts the cheese. 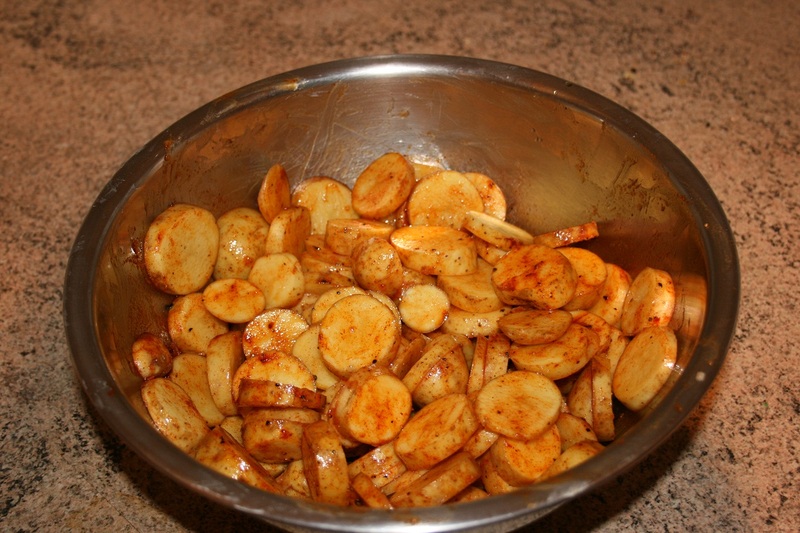 For the potato wedges, mix canola oil (or any other oil that has a high smoke point and a mild flavour) in a large bowl with a tsp of smoked paprika, pinch of salt and a tsp of dried thyme. 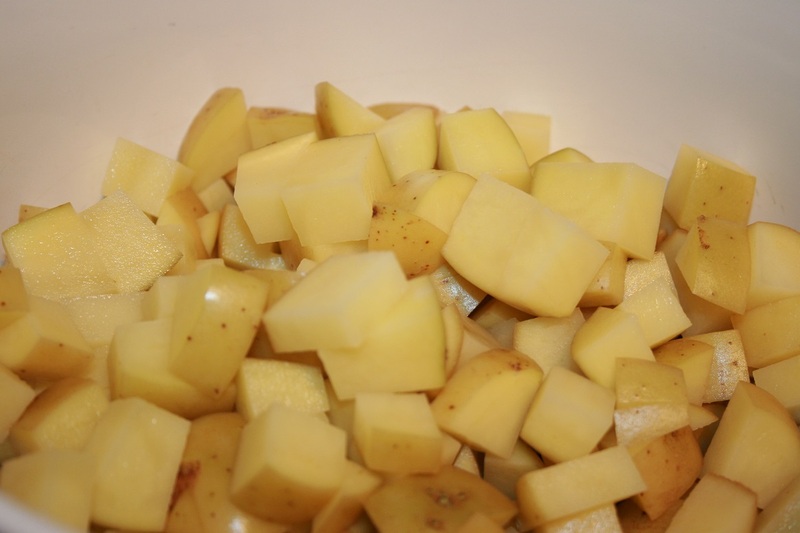 Cut your potatoes into wedges and toss in the oil. Bake at 200° C for 30-40mins, until soft and fluffy on the inside and crispy on the outside.